Ceiling fans cool people, not rooms. So when you walk out, remember to save energy and money by turning the fan off. And don't forget to turn off lights when you leave the room. A nice clean and organized home helps little ones start the year off well with a plan on how to succeed and stay organized themselves for this upcoming year. 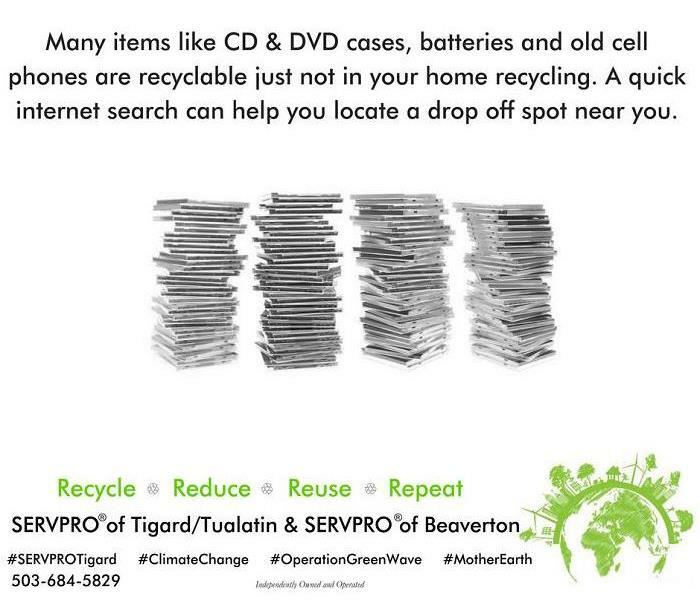 Although we can’t help with the shopping, homework or the organizing, we can help with the cleaning. What to do when there is water coming from my ceiling in Wilsonville. 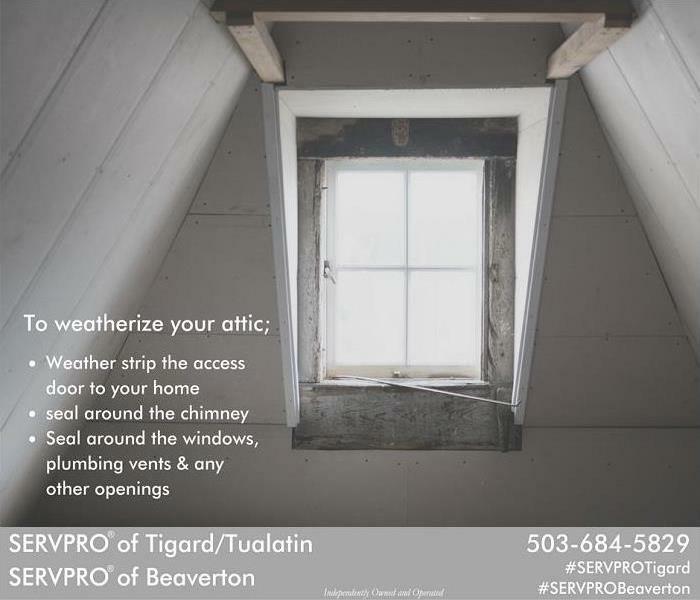 Sometimes there will be a leak in your home from the second floor & water will cascade down through light fixtures or sheetrock causing a collection of drips similar to Silver Falls. 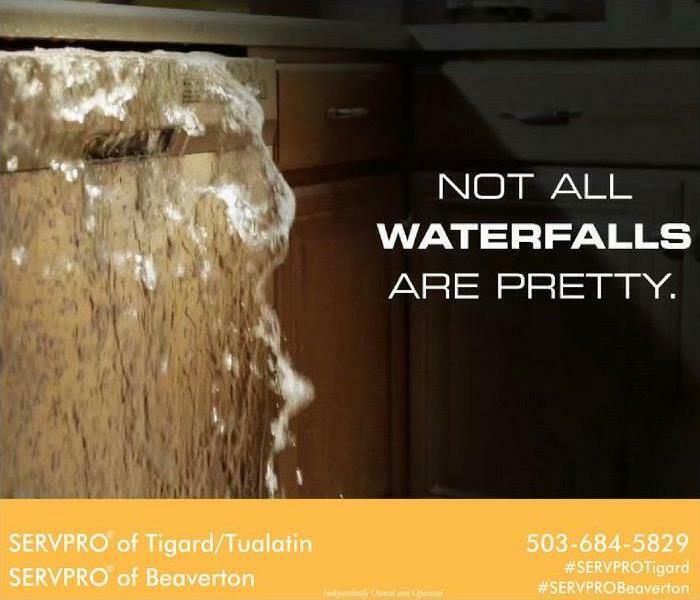 Or your dishwasher malfunctions and you have your own personal Multnomah Falls in your home. 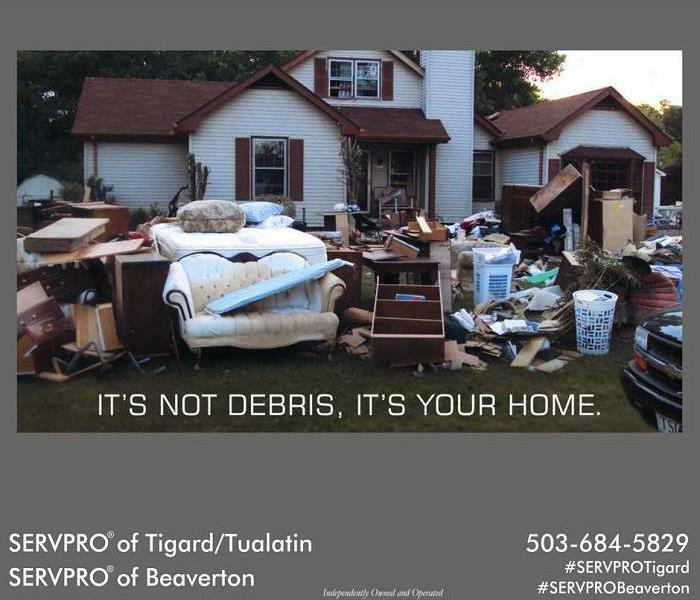 We have been helping customers like you for over 25 years when disaster strikes. 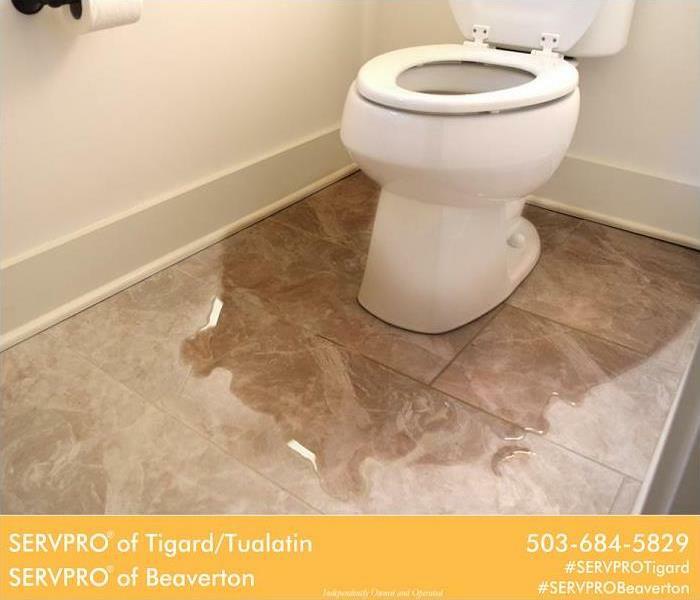 Water damage can happen anytime & anywhere from dishwasher leaks, toilet clogs or wax ring failures on toilets. 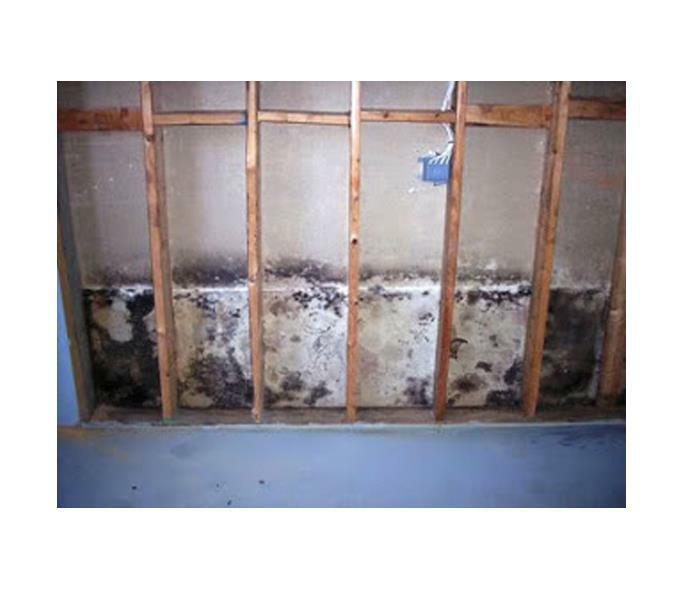 Sometimes you are not even aware of a leak inside a wall until there is a musty smell or discoloration on sheetrock. Here in the Metro area, it’s normal for temps to climb to near triple digits. 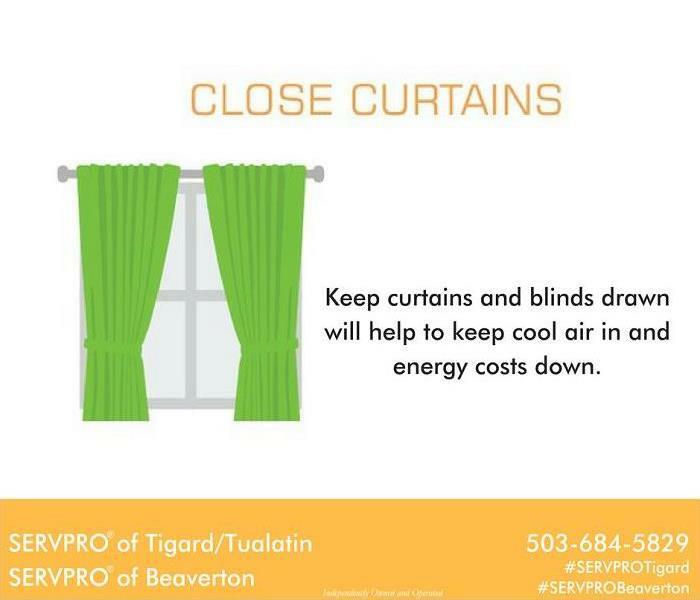 Keeping curtains & blinds shut can help keep the cool air in & hot air out. 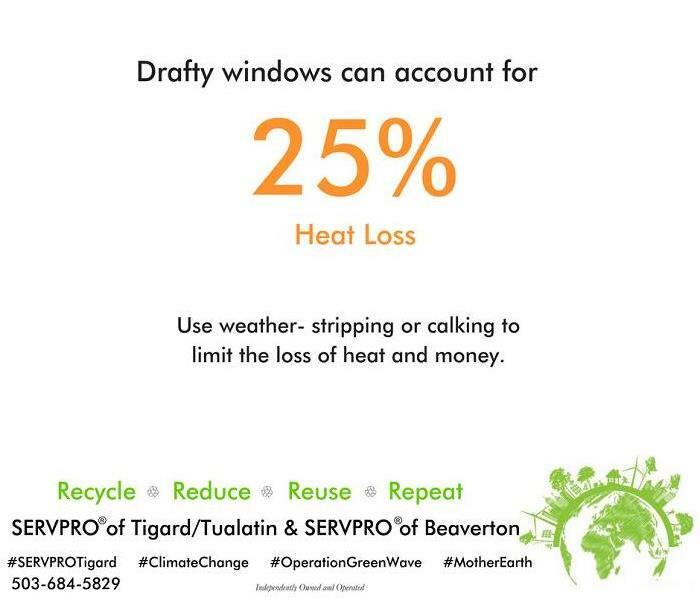 In these summer months, the temperatures in Tigard, Beaverton and surrounding areas can easily hit triple digits. 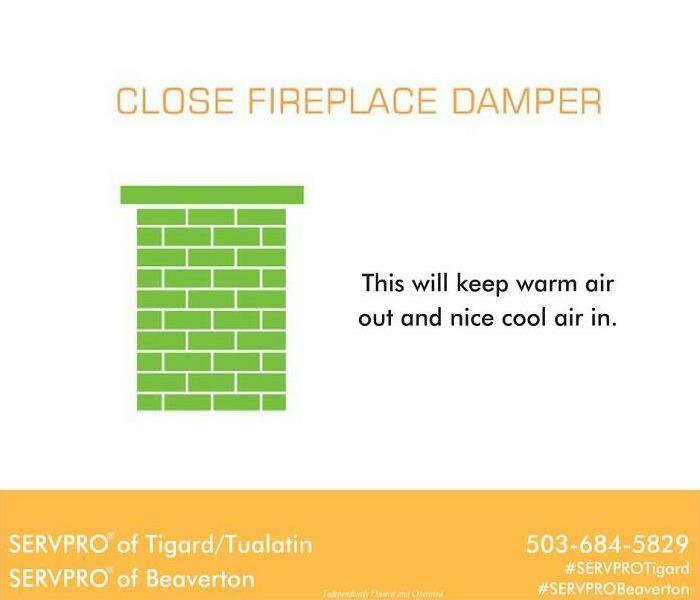 Make sure to close the damper in your chimney to help keep the hot air out and the cool air in. 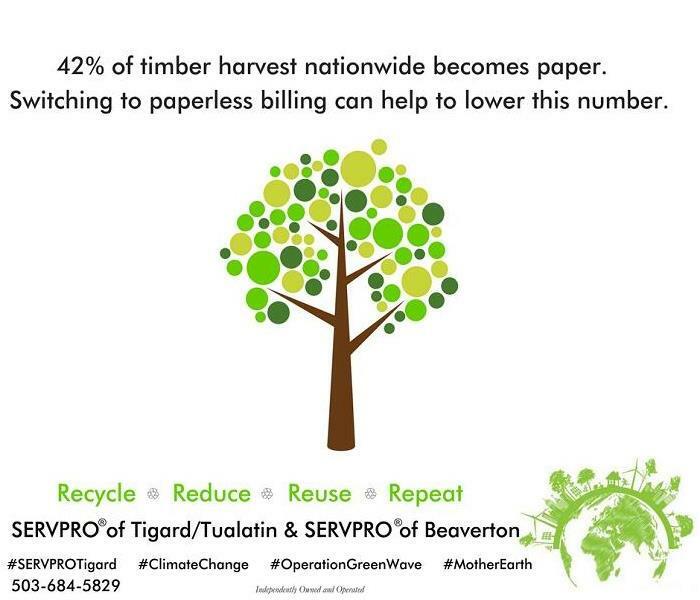 Call us at 503-684-5829 to speak about how we can help you. 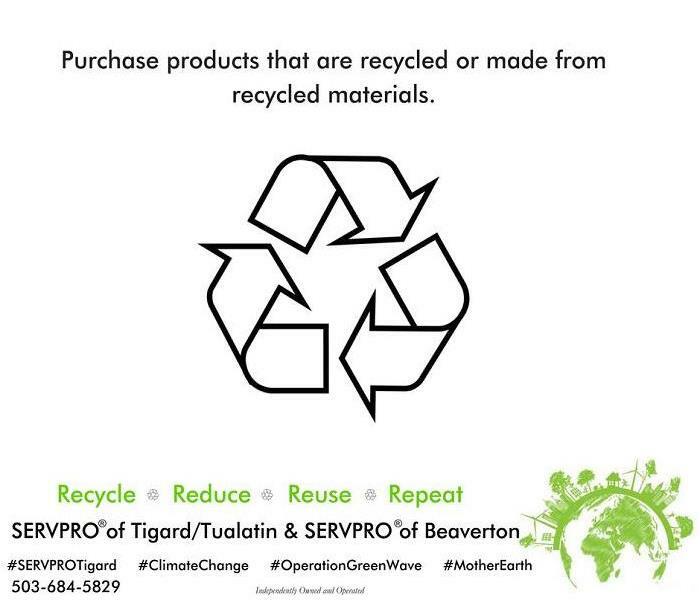 We are Here To Help® make it “Like it never even happened” make sure to call us at 503-684-5829. 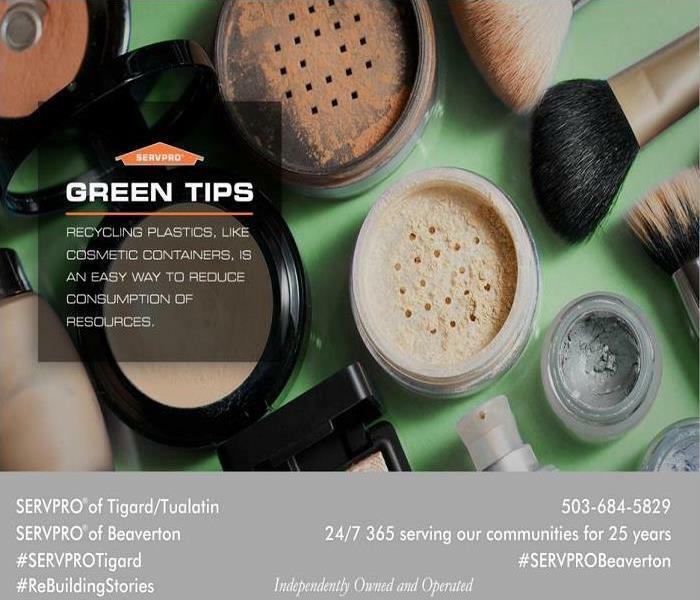 SERVPRO® of Tigard/Tualatin & SERVPRO® of Beaverton is committed to helping create and foster a green, healthy, inclusive and positive community for all of us to enjoy and thrive in. We are Here To Help® when disaster strikes 24/7, 365 at 503-684-5829. 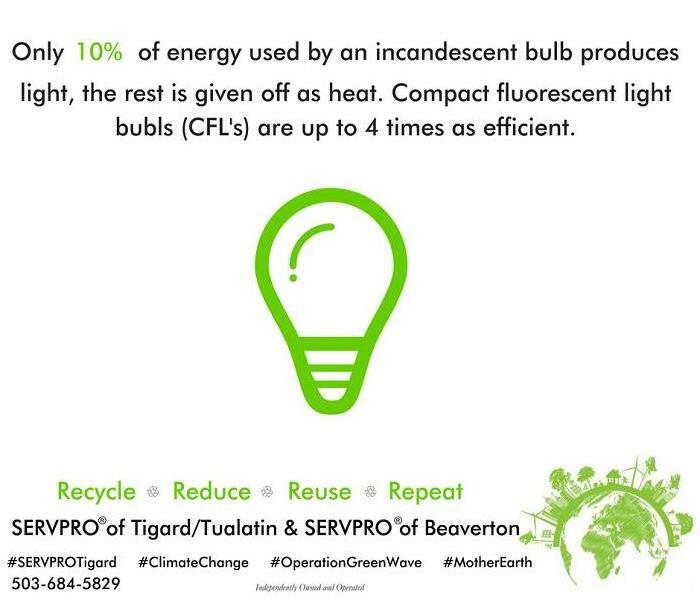 90% of energy for a light bulb is wasted. 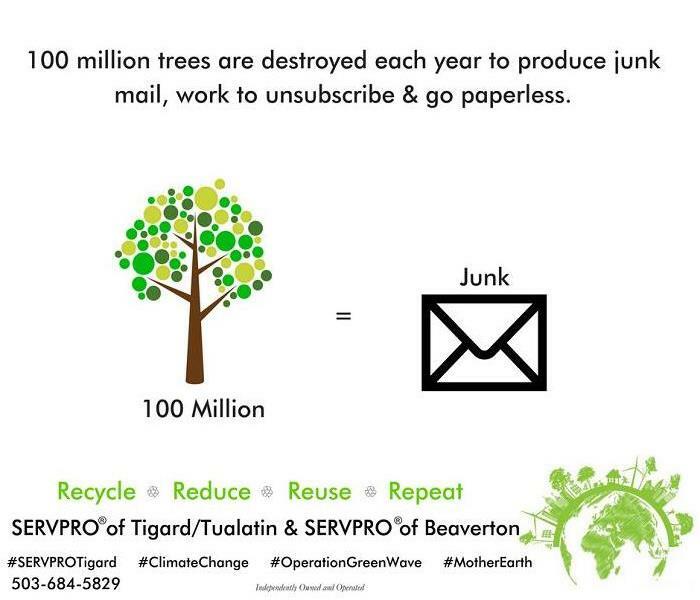 How to be green in a digital age. 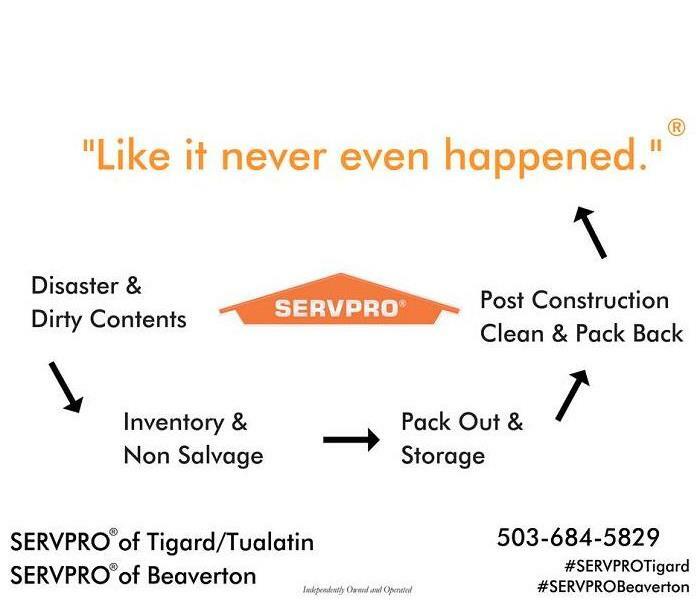 SERVPRO® of Tigard/Tualatin will help you to walk through the decisions needed to make it “Like it never even happened.” If disaster should strike call the team who has 25+ years of experience in the area, we are ready 24/7 365 at 503-684-5829. Often times restoring contents and materials in your home is a much faster process for you, meaning you will get to “Like it never even happened” sooner and back to life as it was before the disaster. 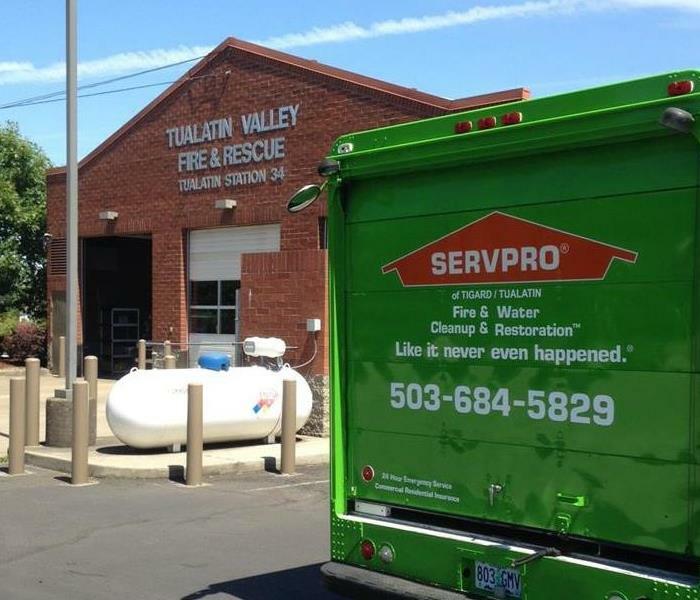 If water damage or fire should strike call the team who has 25+ years of experience in the area, we are ready 24/7 365 at 503-684-5829. 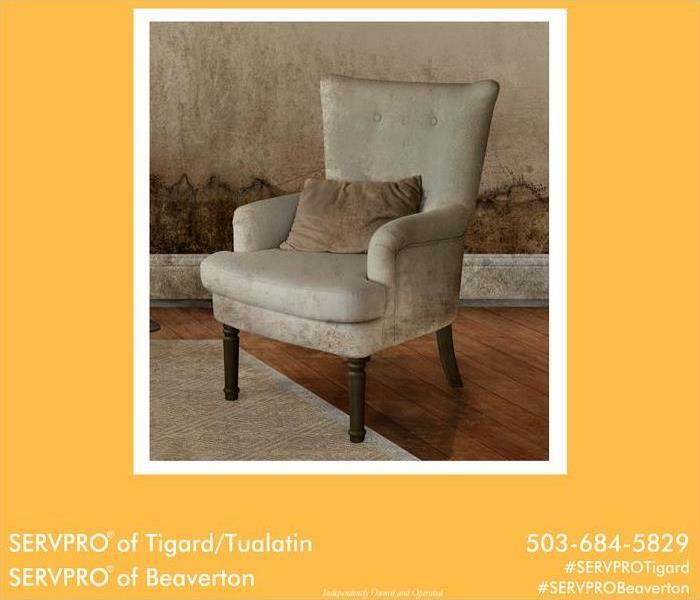 SERVPRO® of Tigard/Tualatin works with you to save your family heirlooms, treasures and memories. 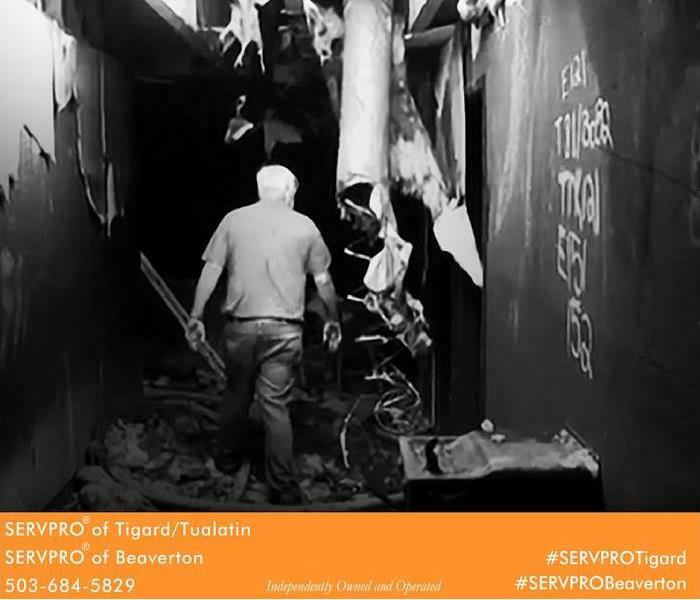 We will help you to walk through the decisions needed to make it “Like it never even happened.” If disaster should strike call the team who has 25+ years of experience in the area, we are ready 24/7 365 at 503-684-5829. The repairs are done, now what? Where is my stuff going to be when my house is a disaster? Who do you call after you have a fire? Our crews are hard at work restoring a home after a fire. 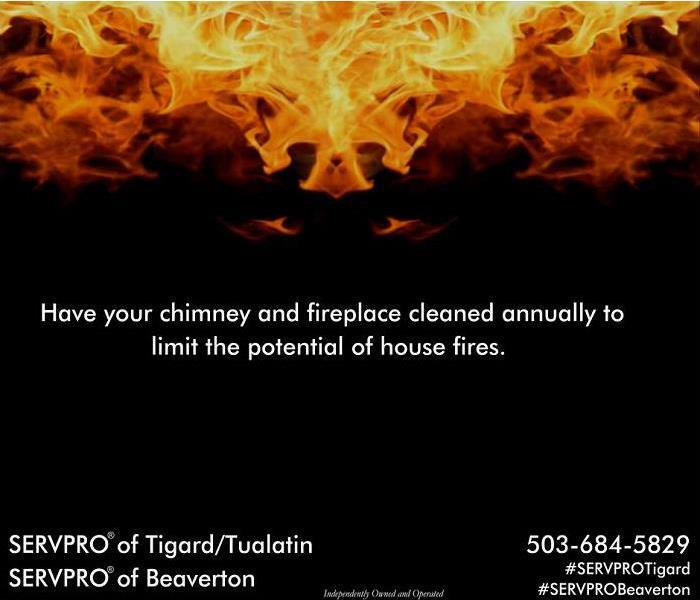 Fire and smoke damage can hit anywhere at any time. Our crews are on site HEPA Vacuuming the walls, then will follow up with dry sponging before the walls are sealed and painted. 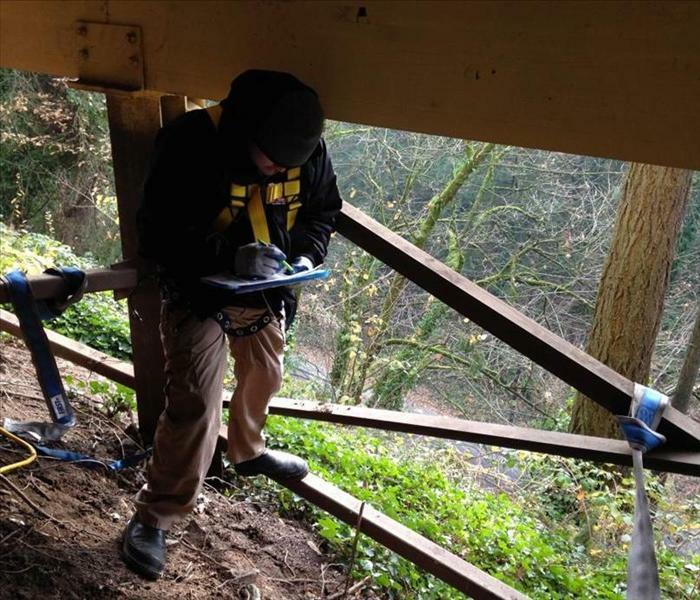 Our crews are the best trained, most prepared and the most dedicated anywhere. 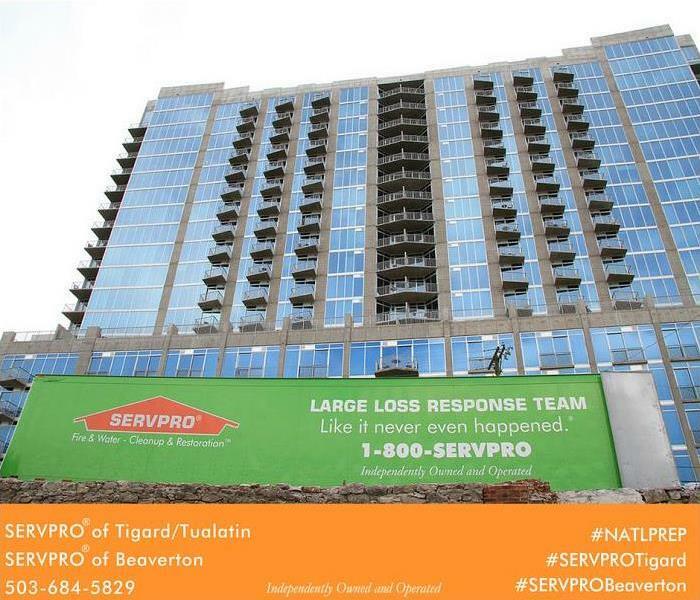 They are hard at work making it “Like it never even happened.” If you have fire or smoke damage make sure to call SERVPRO of Tigard at 503-684-5829. 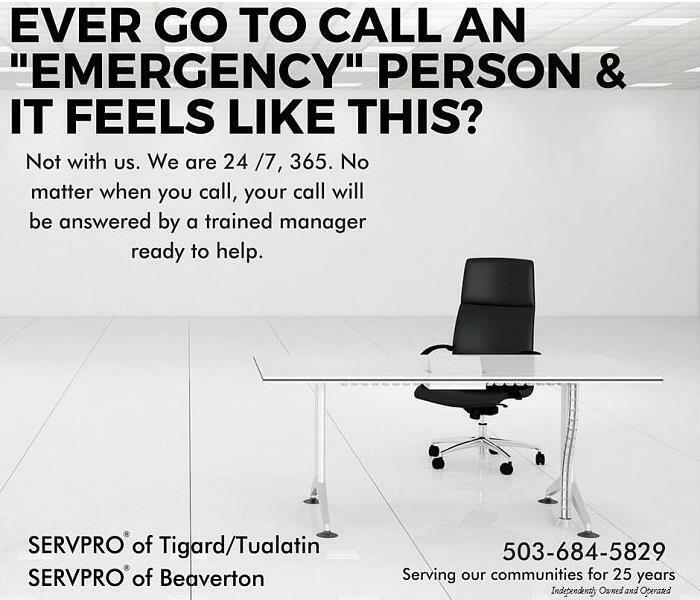 We are ready 24/7 365 to help you. 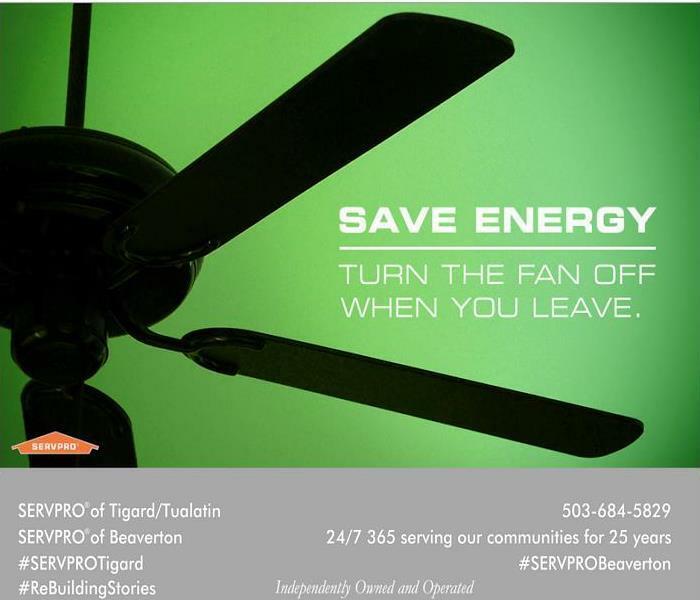 SERVPRO® of Tigard/Tualatin and SERVPRO ® of Beaverton have been serving our communities for 25 years. 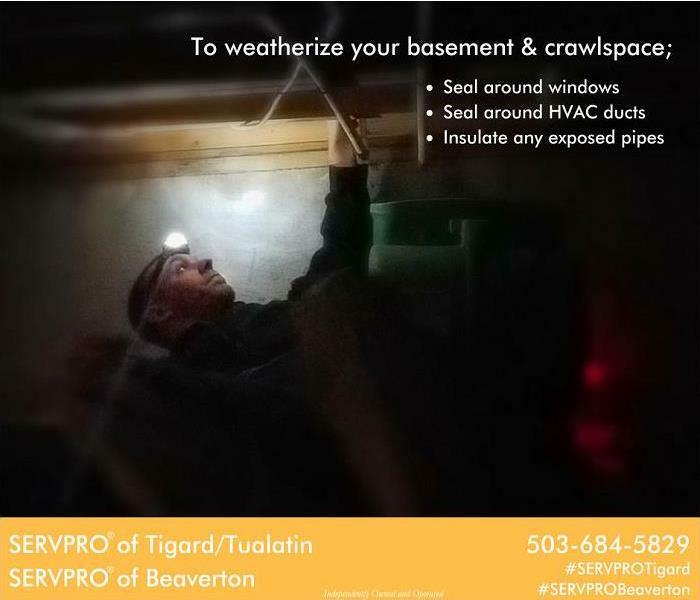 What do you do when….. the crawlspace is on the side of a cliff? 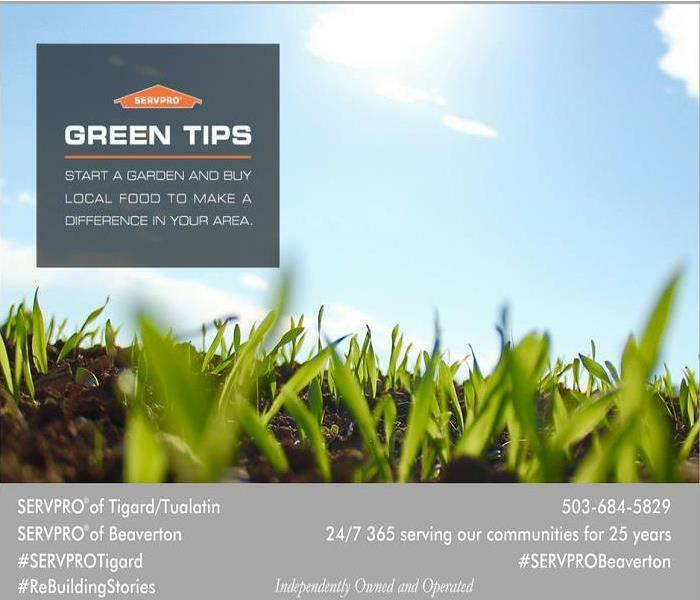 SERVPRO® of Tigard/Tualatin and SERVPRO® of Beaverton have been serving our communities for 25 years. 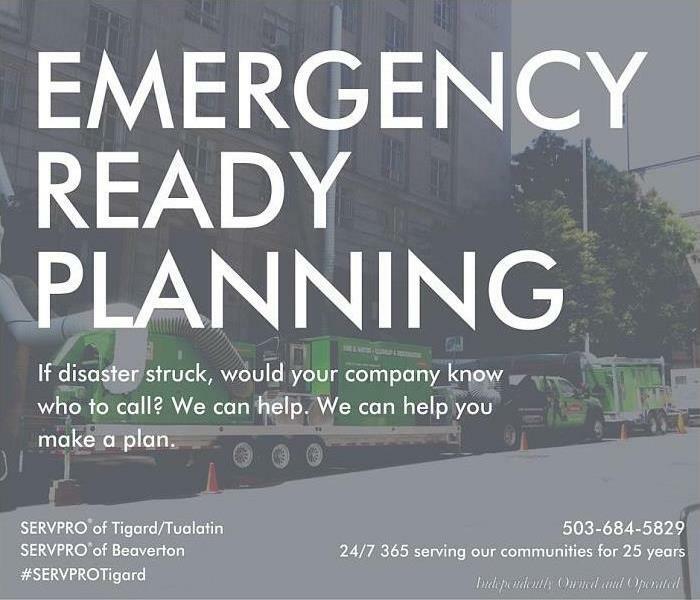 Our crews are trained and equipped to help you when disaster strikes. We are committed to helping customers just like you when disaster strikes. We are a twenty four hour a day emergency service provider. We work 365 days a year, when you call, your call will be answered. 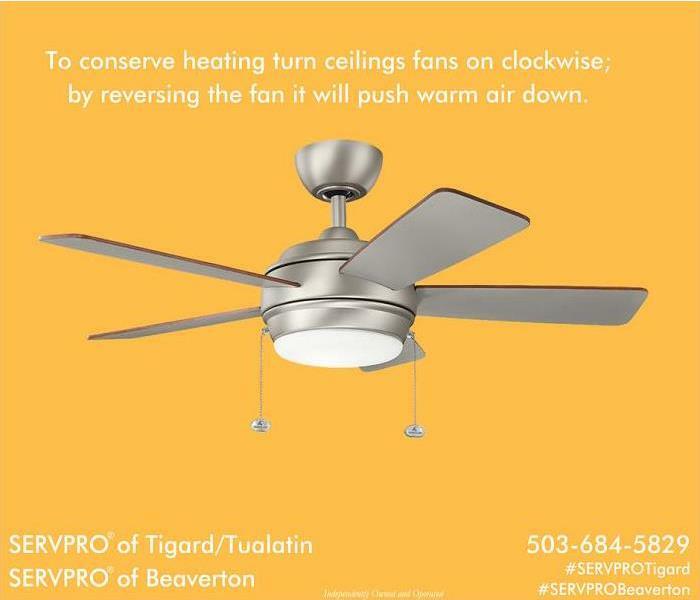 So if disaster should ever strike make sure to call SERVPRO® of Tigard/Tualatin and SERVPRO® of Beaverton at 503-684-5829. 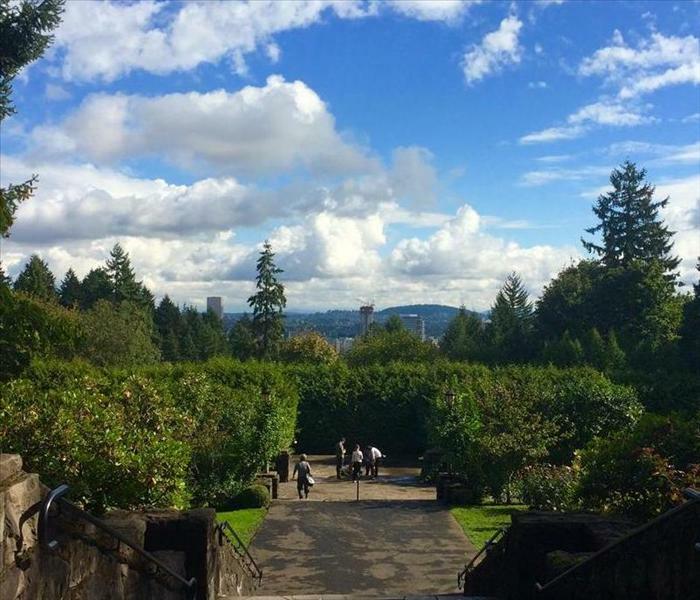 This Rose City of ours is a one of a kind city, and we would not want it any other way. From the fantastic coffee and beer to these incredible views. We can not imagine life anywhere else. 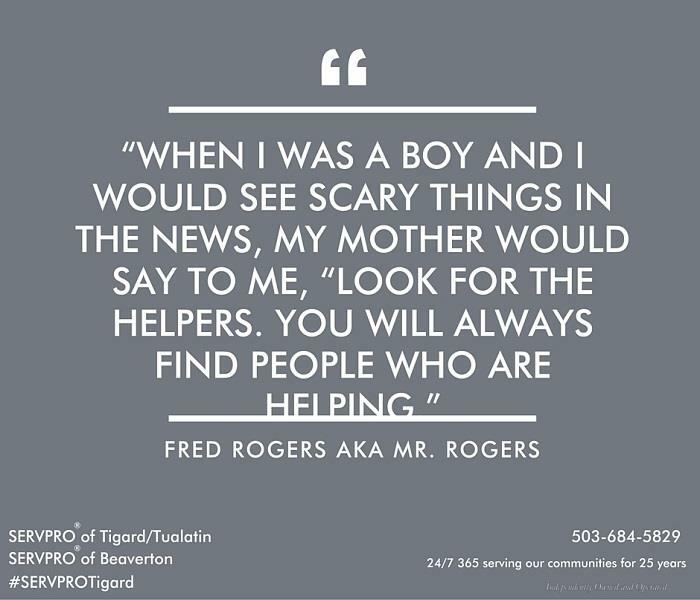 SERVPRO of Tigard/Tualatin & SERVPRO of Beaverton want to take a moment and remember all those that lost their lives 13 years ago. 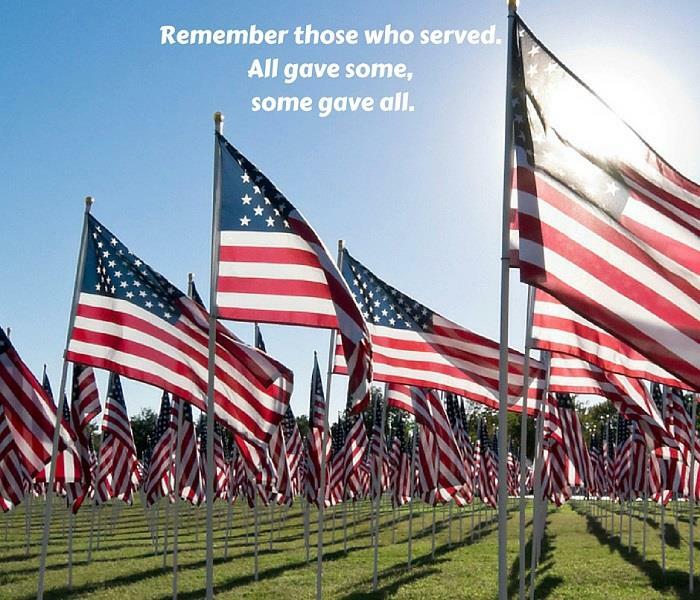 We want to thank those heroes who ran in while others ran out and thank them for their sacrifice and service. 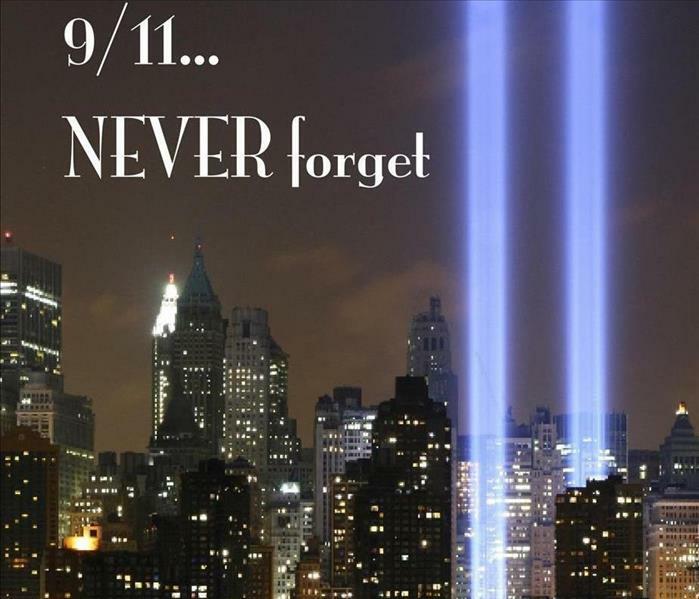 We pray that all those around the world affected on that day will find peace and strength as they remember those they love and will always remember and carry with them. 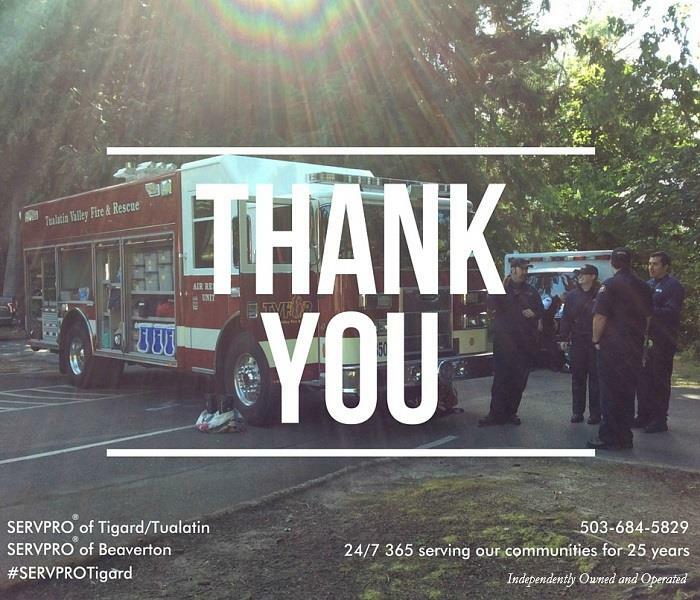 We at SERVPRO® of Tigard/Tualatin & SERVPRO® Beaverton are so thankful for the service that our local fire fighters and first responders provide. We stopped by local fire houses last week to show some love by passing out ice cream to keep them cool during these hot summer months. 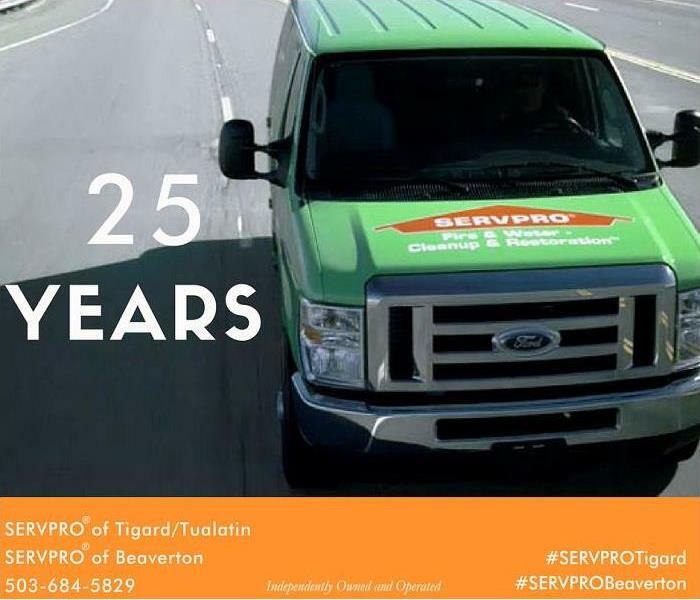 SERVPRO® of Tigard/Tualatin and SERVPRO® of Beaverton have been serving our communities for 25 years. Our crews trained and equipped to help you when disaster strikes. 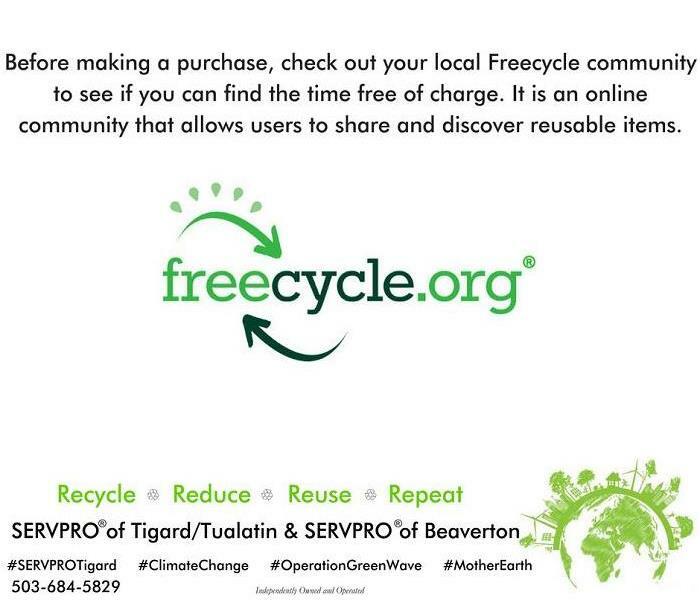 We are committed to helping customers just like you when disaster strikes. We are a twenty four hour a day emergency service provider. 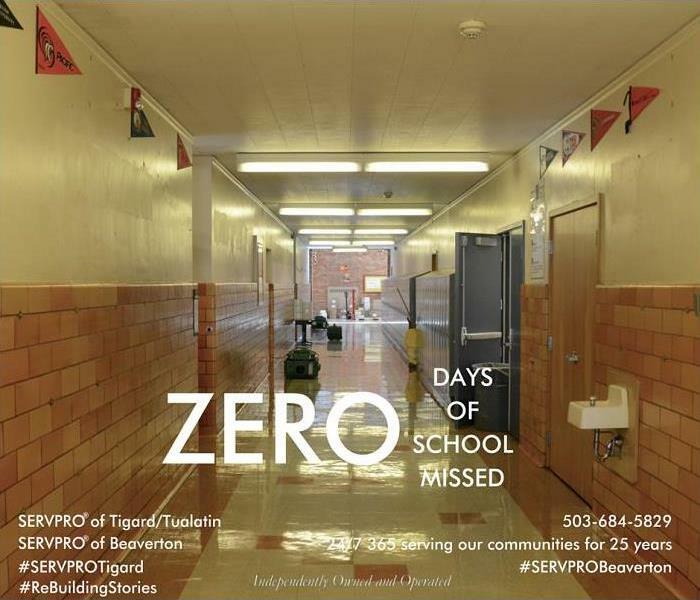 We work 365 days a year, when you call, your call will be answered. 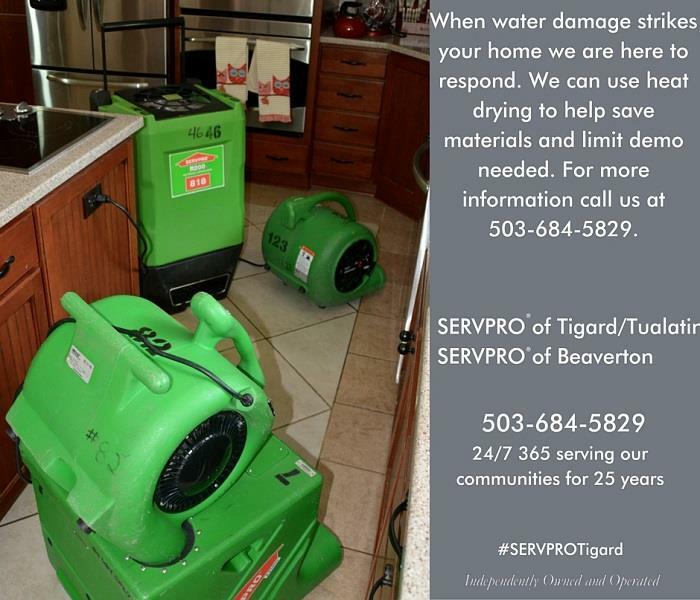 So if disaster should ever strike make sure to call SERVPRO® of Tigard/Tualatin and SERVPRO® of Beaverton at 503-684-5829. We sure had a great day, there where firefighters, and police officers, we had games and coloring, music and laughter. What a great way to raise support for an amazing organization, the Red Cross. 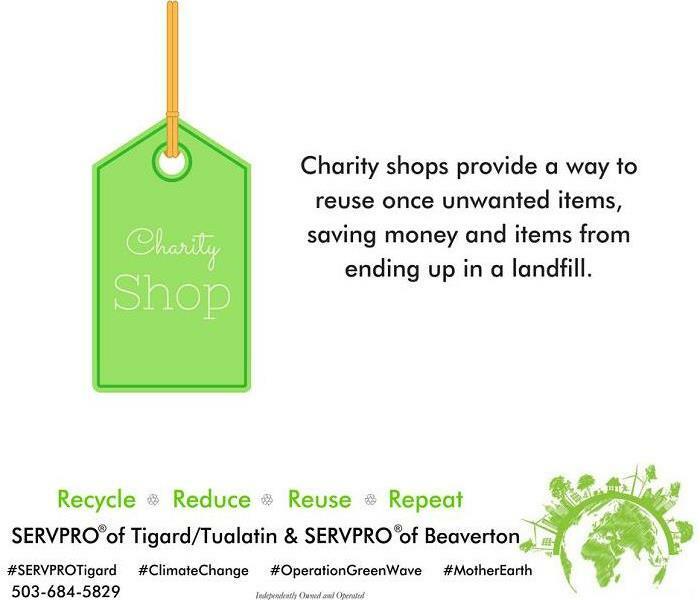 We are so happy that we were able to support them and the work that they do. Thank you to all those who came out in support of the event, hope to see you all there next year! 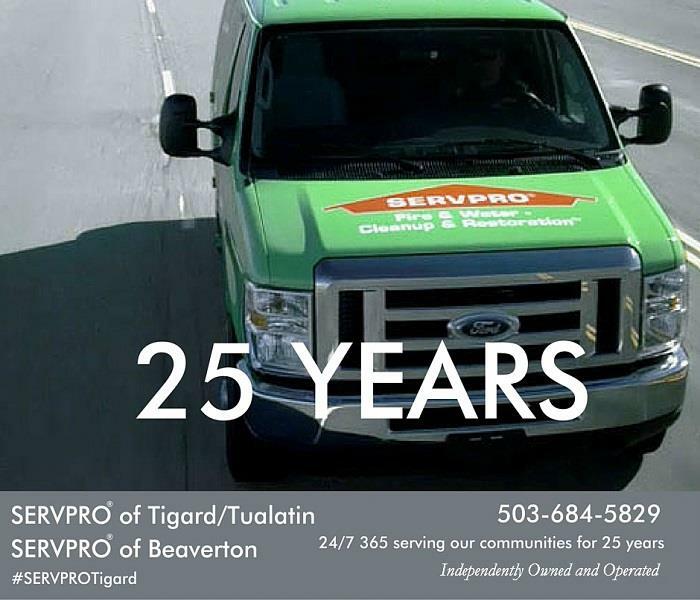 SERVPRO® of Tigard/Tualatin and SERVPRO ® of Beaverton have been serving our communities for 25 years. Our crews trained and equipped to help you when disaster strikes. We are committed to helping customers just like you when disaster strikes. 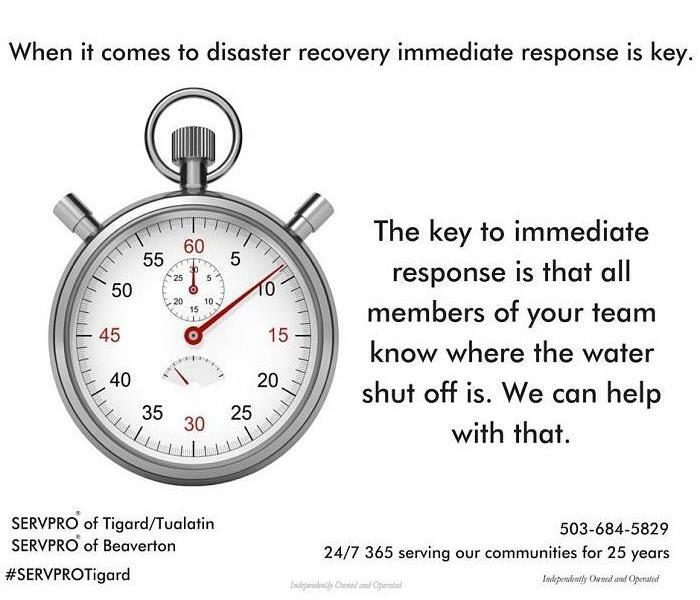 We are a twenty four hour a day emergency service provider. We work 365 days a year, when you call, your call will be answered. 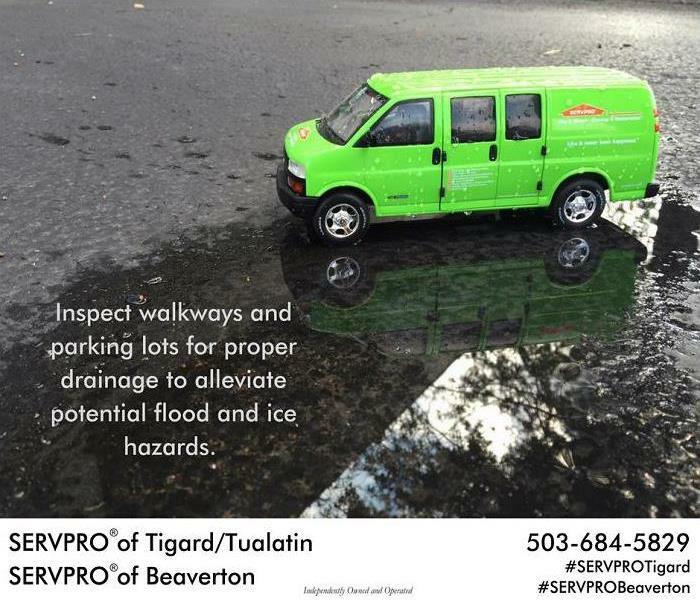 So if disaster should ever strike make sure to call SERVPRO® of Tigard/Tualatin and SERVPRO® of Beaverton at 503-684-5829. There are lots of different companies who show up when disaster hits. 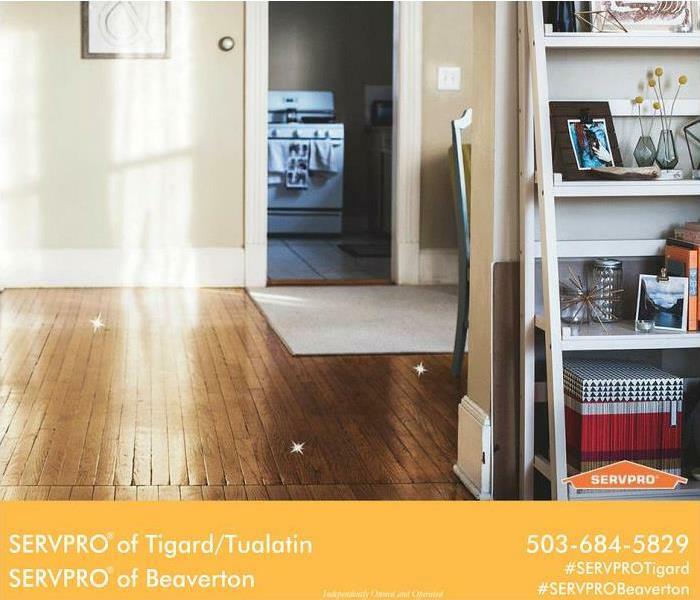 Only SERVPRO® of Tigard Tualatin Beaverton provides the level of customer care that you need from start to finish to help you get back on your feet and help make it "Like it never even happened". 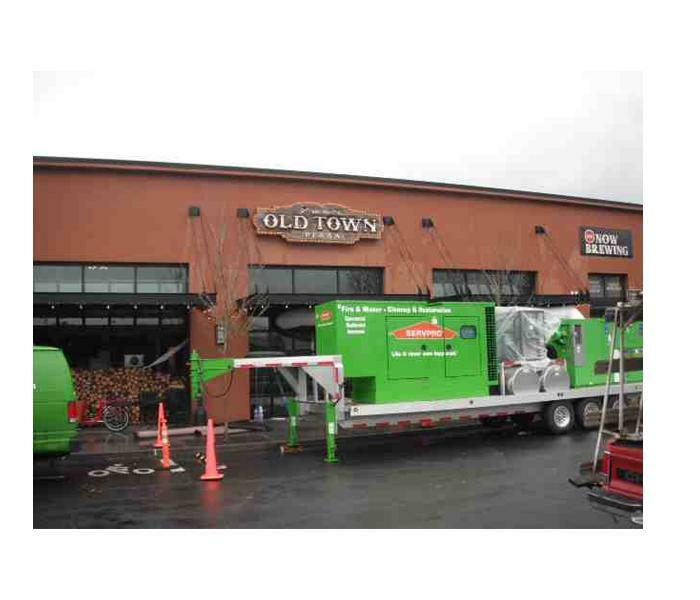 A NE favorite, Old Towne Pizza & Brewery had a fire. They were told they would be down for 6 months, and our crew had them back up and slinging 'Za in less than 3 months. That is getting it done! Opened up Wall Cavity to see the Microbial (moldy) growth! Many times on jobs, we can not know the extent of a job until we can see inside walls. As you can see in this picture, there can be lots of damage growing and hidden behind "normal" looking walls! 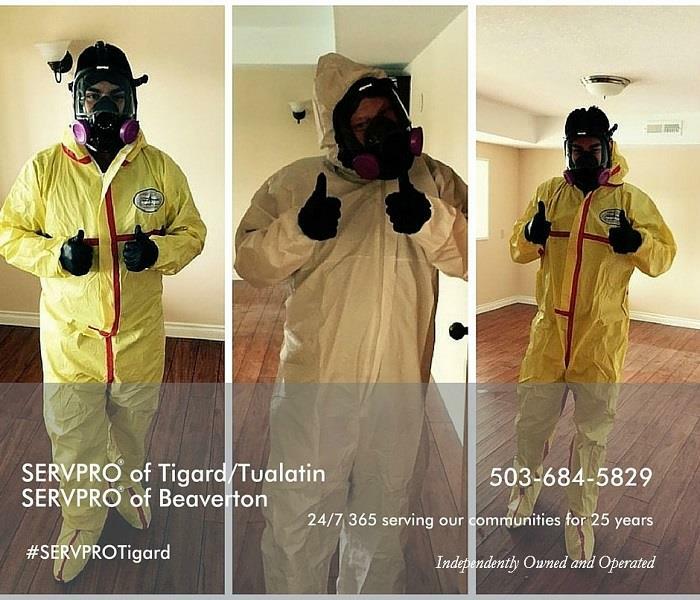 YES, we do Mold Remediation. 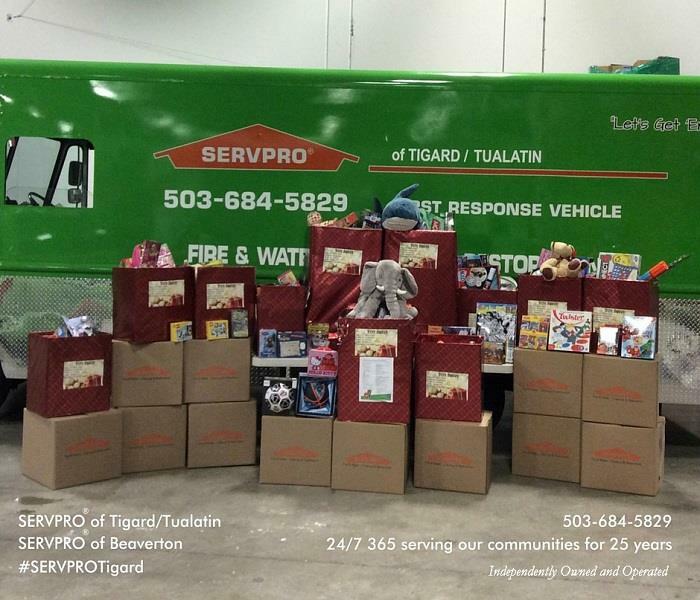 SERVPRO® of Tigard/Tualatin and SERVPRO ® of Beaverton have been serving our communities for 25 years. Our crews trained and equipped to help you when disaster strikes. We are committed to helping customers just like you when disaster strikes. We are a twenty four hour a day emergency service provider. We work 365 days a year, when you call, your call will be answered. 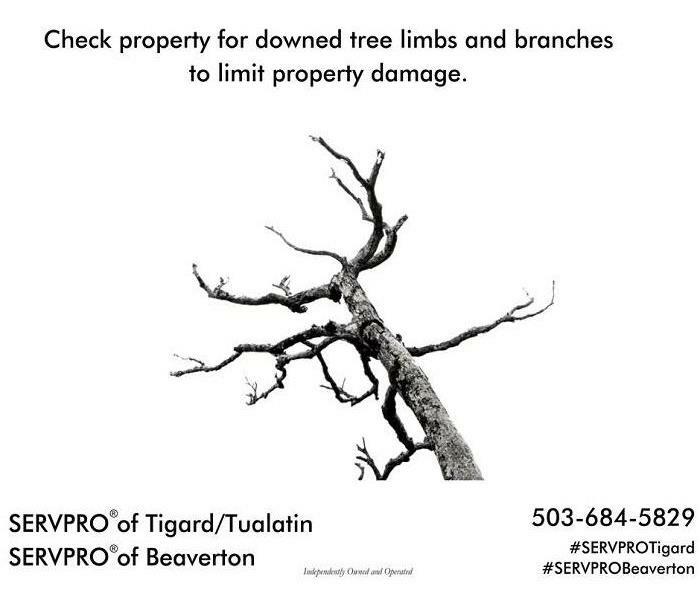 So if disaster should ever strike make sure to call SERVPRO® of Tigard/Tualatin and SERVPRO® of Beaverton at 503-684-5829. We get called "HERO" a lot... even though we don't ALL look like Spidey! 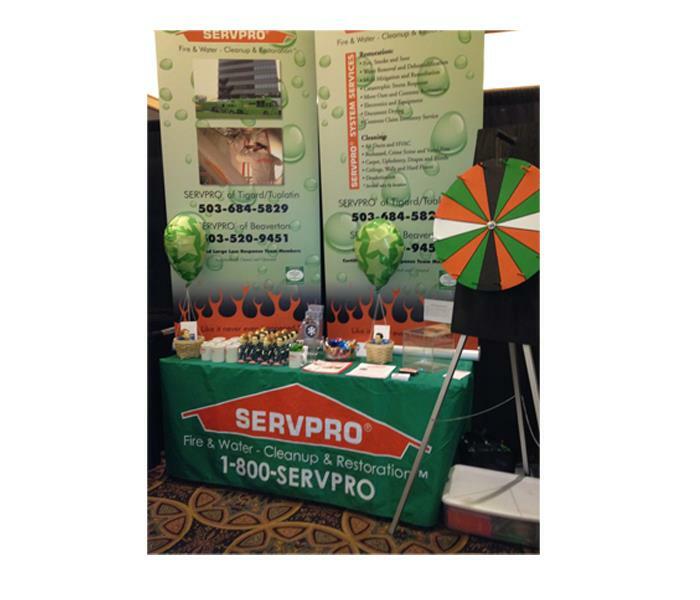 We did a major water damage cleanup job at a huge Auto Wholesaler & Auction business. 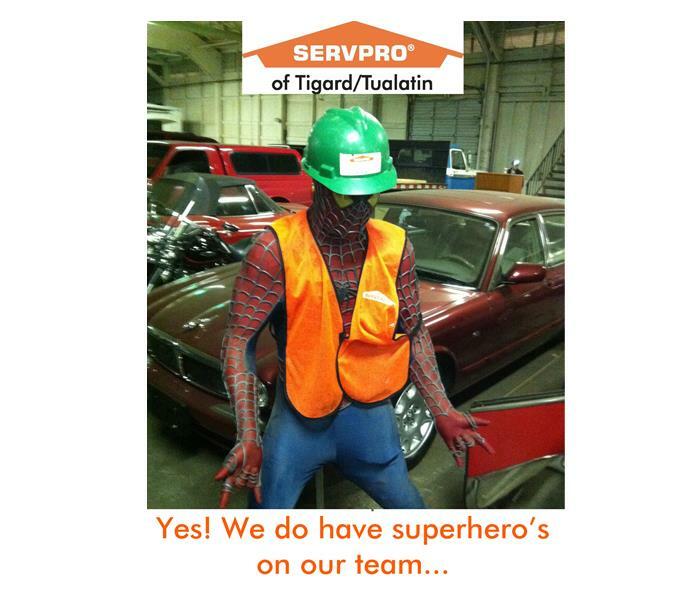 We found Spiderman on scene and he ended up being one of our Temp Workers! Too bad the rest of our crew out-shined the Amazing Spiderman's Hero Skills!!! 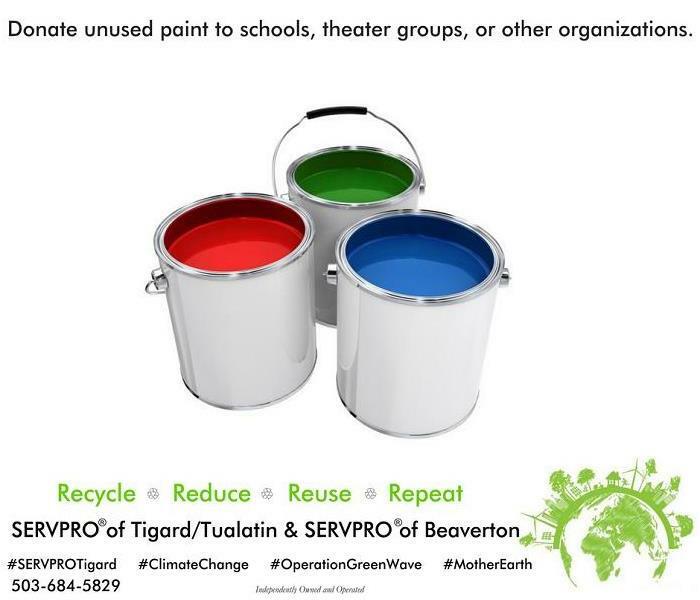 SERVPRO of Tigard/Tualatin & SERVPRO of Beaverton are committed to being a positive change in our community. 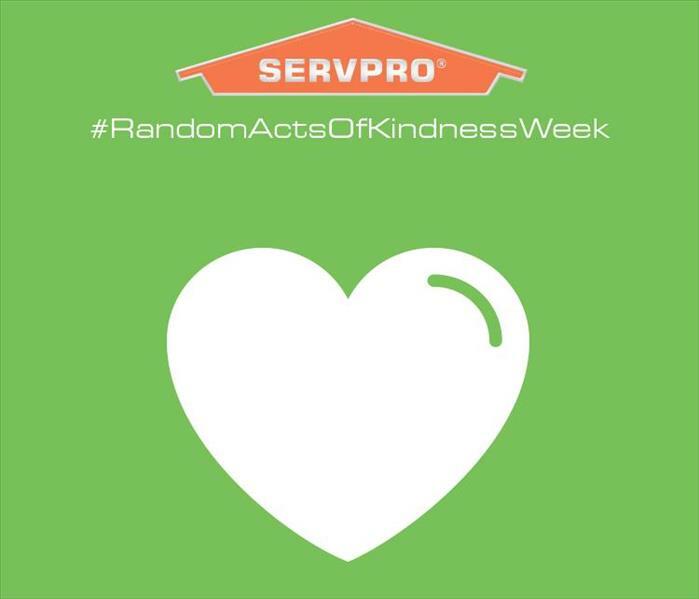 It's #RandomActsOfKindnessWeek! Remember to smile at everyone you see today. How can you help to make others smile? Oh this city of ours. Oregonians are always proud of where they come from, and how can you not be when you have beautiful places like this to call home. 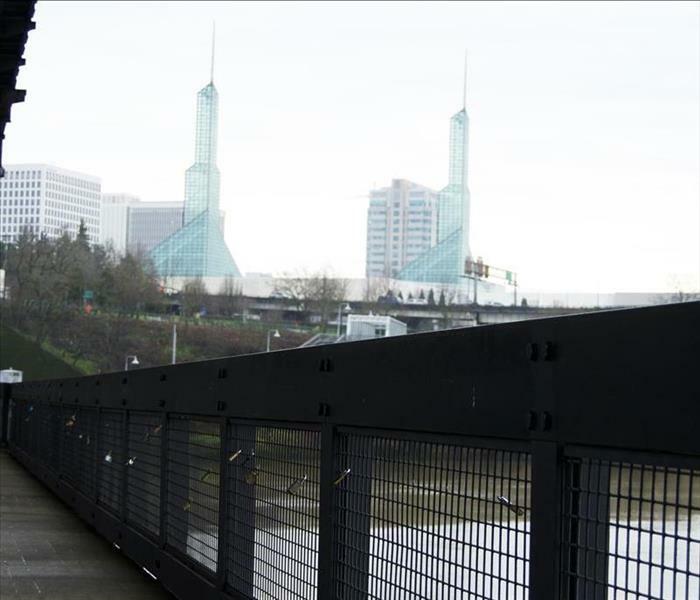 Walks along the river is one of our favorite ways to start a morning. Oh Stumptown, how we love you. Oregonians are always proud of where they come from, and how can you not be when you have beautiful places like this to call home. Where are your favorite spots around town to hang out? Oh RCTID, how we love you. Oregonians are always proud of where they come from, and how can you not be when you have beautiful places like this to call home. How do you like to spend time in this great place of ours? 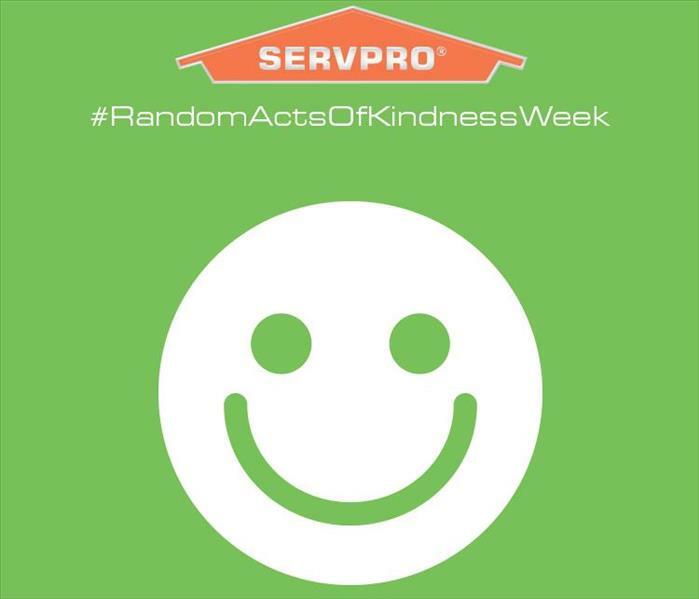 It's #RandomActsOfKindnessWeek! You should invite a coworker to lunch today. How can you show kindness? 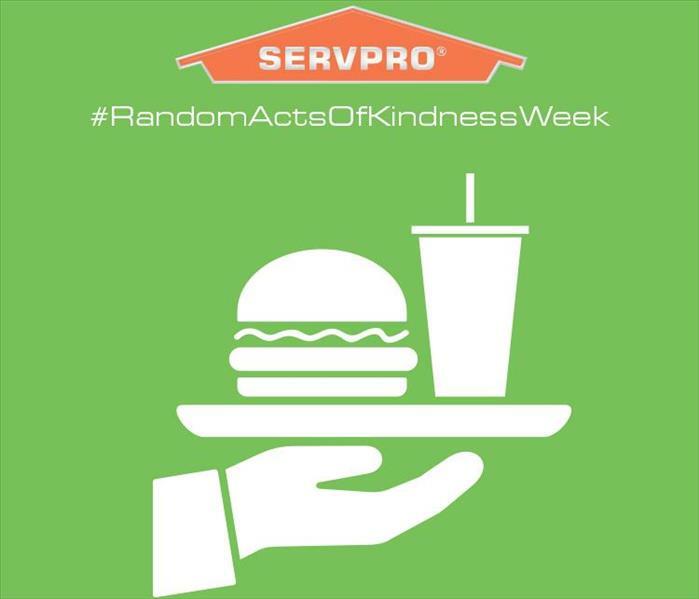 It's #RandomActsOfKindnessWeek! Did you pay someone a sincere compliment today? What are you thankful for? 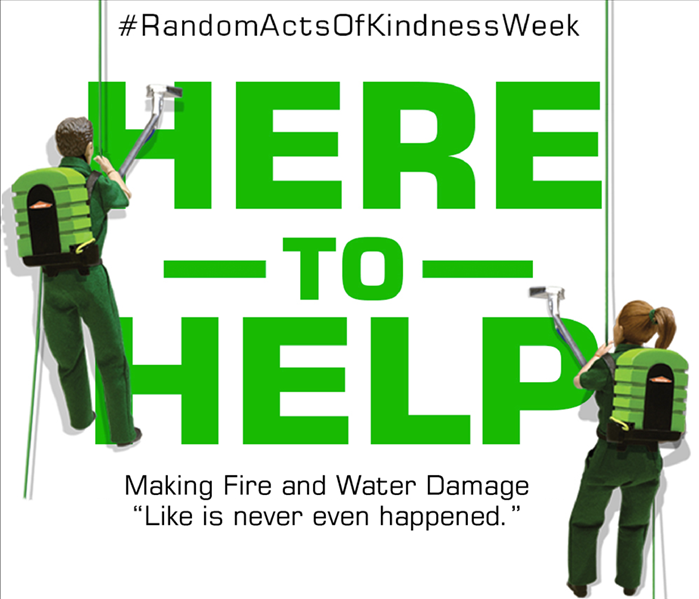 It's #RandomActsOfKindnessWeek! 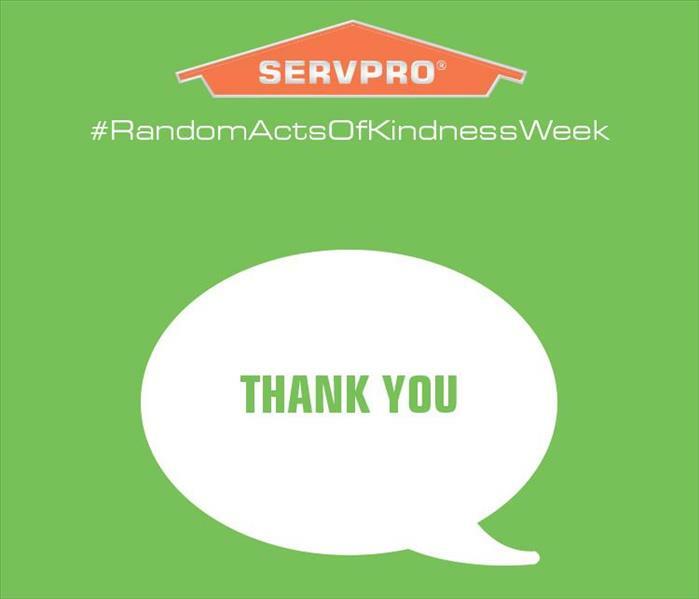 Ask what you can do to help a spouse or loved one this week. 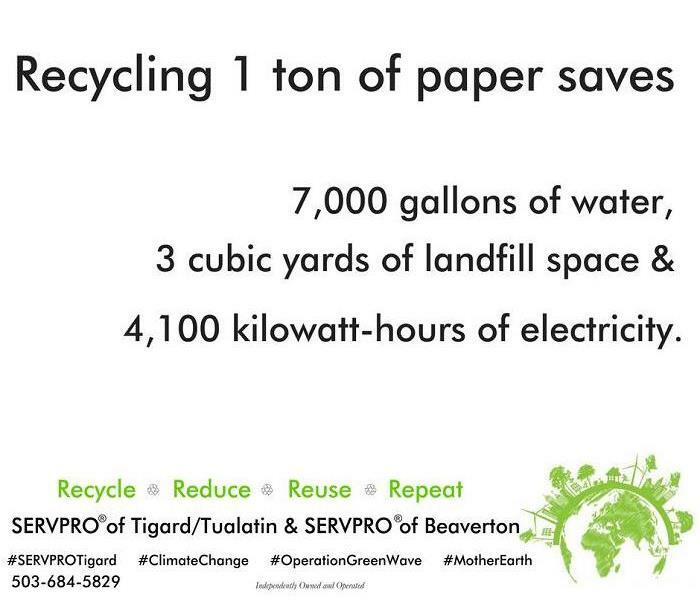 SERVPRO of Tigard/Tualatin & SERVPRO of Beaverton are committed to being a positive change in our community.WE know that by being active in government both local and national that we can create positive change. 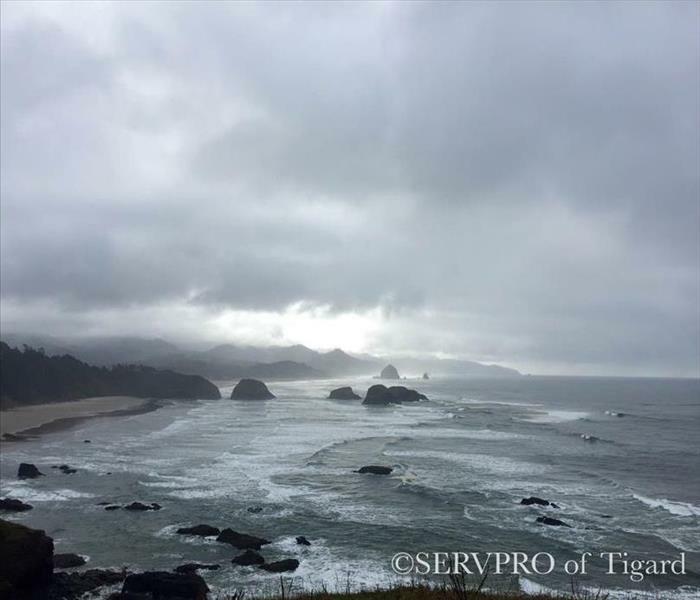 The Oregon Coast is beautiful any day, sun or storm. We love it no matter the weather. We want to know what your favorite places along the coast are? Any unknown wonders? Here in the Metro area the flowers are starting to blossom and the trees are coming back to life. If we are not going to get snow we might as well have Spring right!?! 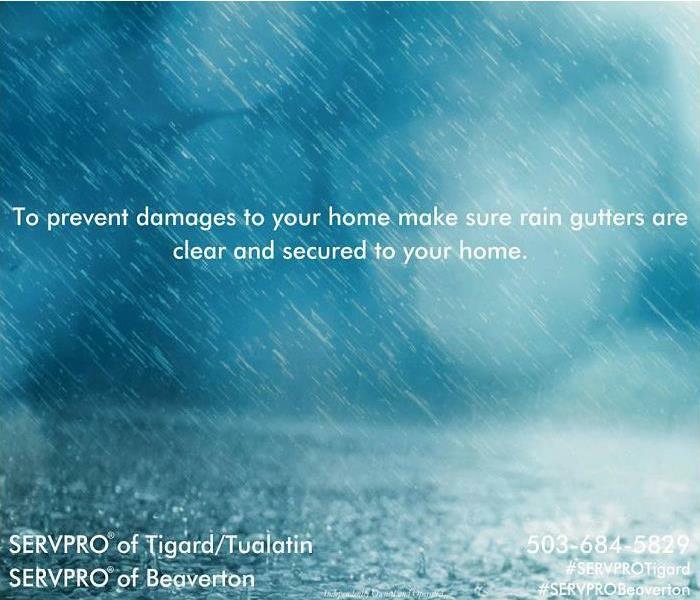 Fires and storms cost more than monetary damage to your property. They can cost you the moments you love most. 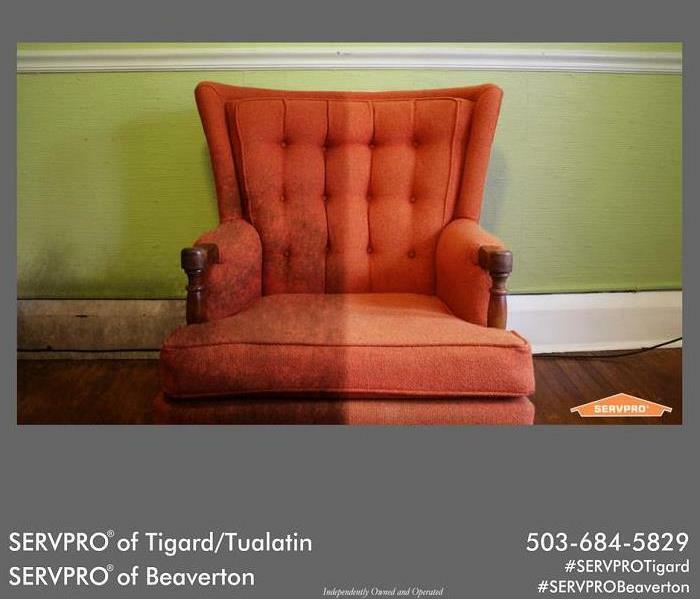 When you experience damage, SERVPRO of Tigard/Tualatin will be here to make your house feel like home again. 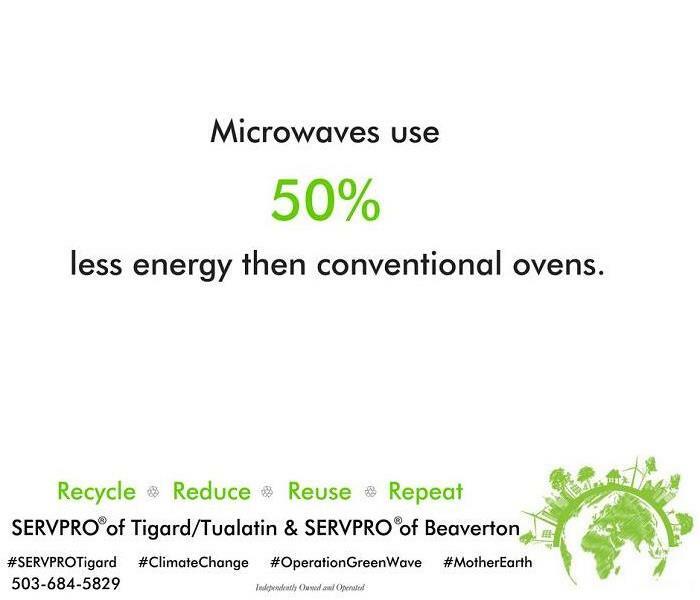 Call us at 503-684-5829. 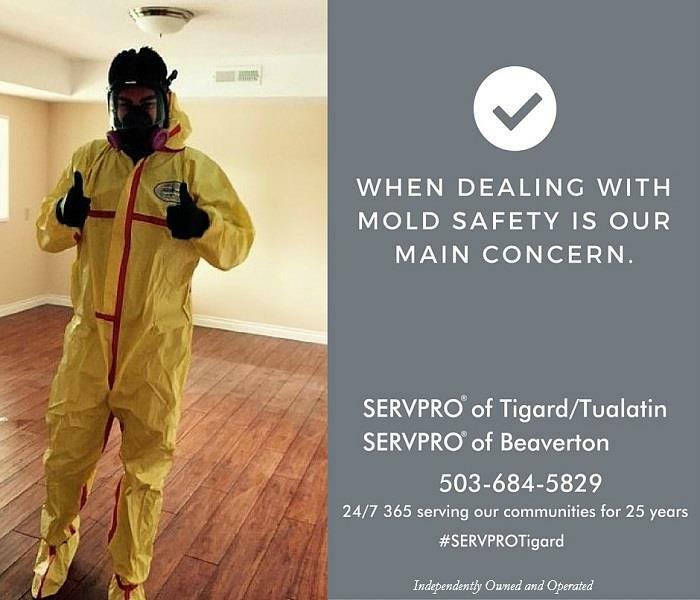 SERVPRO® of Tigard/Tualatin & SERVPRO® of Beaverton have been helping customers just like you for 25 years when mold causes damage in the home. 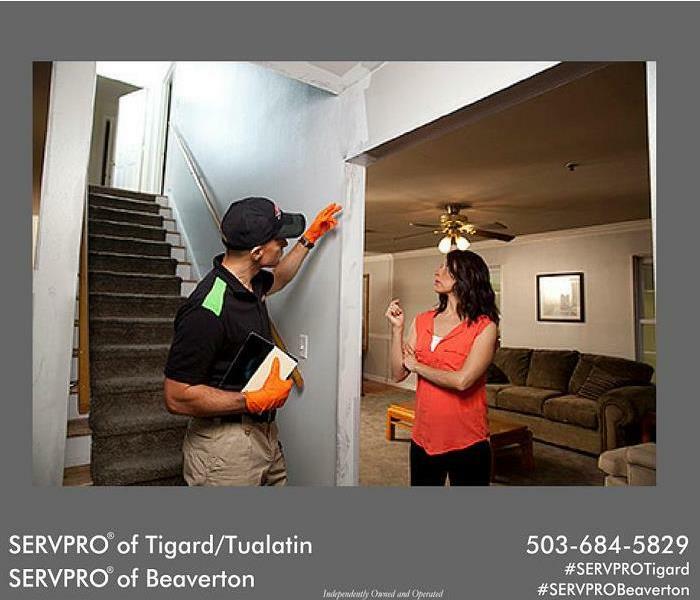 If you have mold concerns in your home call SERVPRO® of Tigard/Tualatin & SERVPRO® of Beaverton at 503-684-5829. 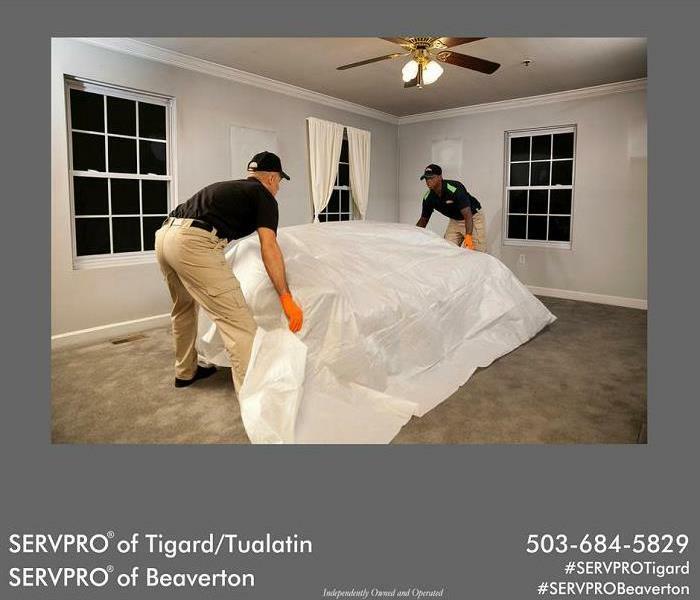 #SERVPROTigard #SERVPROTigard25Years #SERVPRO A disaster in a home, your home can be a very traumatic experience for people. We have team of trained crew members who are experienced to help walk with you during the process and see what can be cleaned up and made like new. We love being able to show our customers how their beloved treasures and family heirlooms have cleaned up and will be around for generations to come. We love helping them make it “Like it never even happened." Here are a few before and after photos from a recent clean up that show the state contents are in after a fire and how they come out after our amazing crews clean them up. What do I do when I find mold in my home? As a business owner or the manager of your company, employee safety and satisfaction is incredibly important. 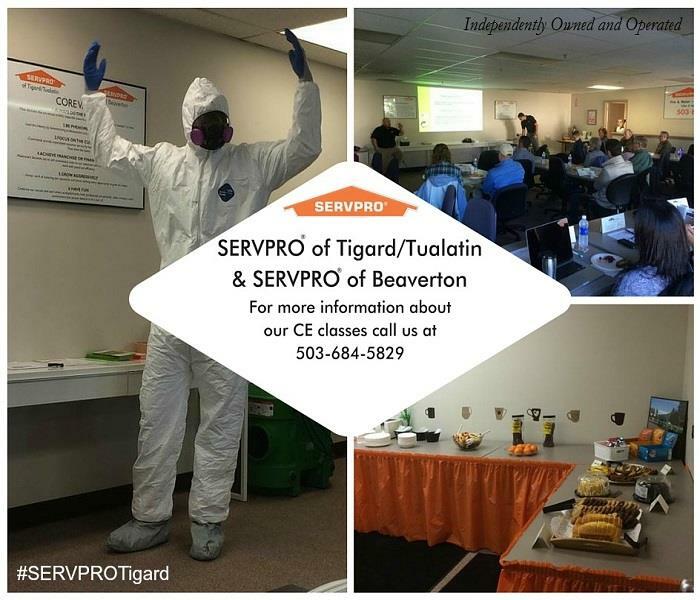 It is important to make sure that precautions are taken to insure that your business is not exposed to contaminants that can be harmful to your people and facility. 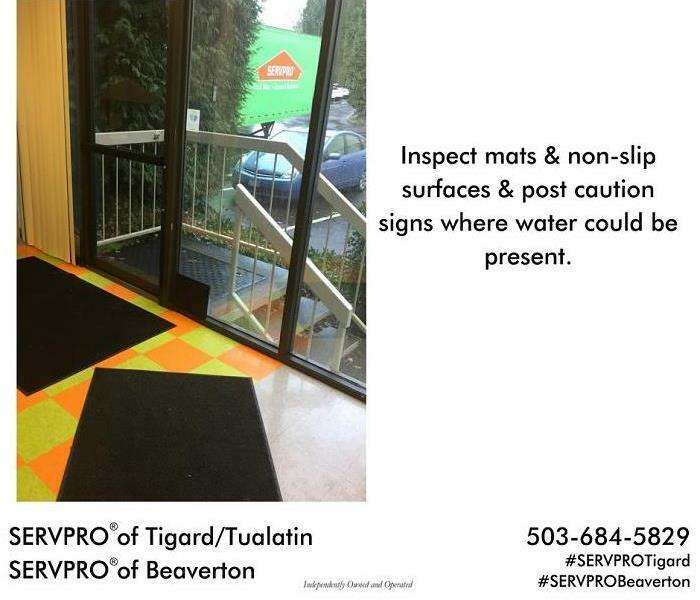 If you have or think you may have a mold contamination, SERVPRO® of Tigard/Tualatin is here to help. 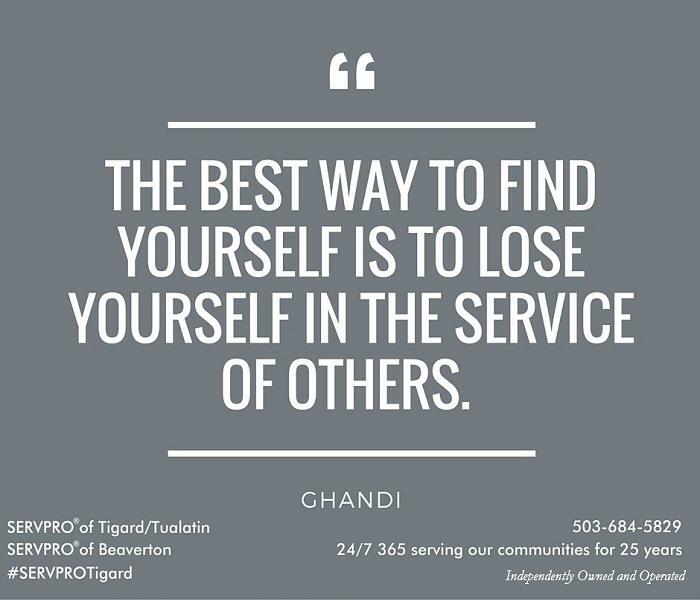 We have been serving business owners and managers just like you for over 25 years. We are committed to working our hardest for you so that you can continue to work your hardest for your business. We work with you to keep your business open and allowing you to stay focused on what is most important to you and your customers. 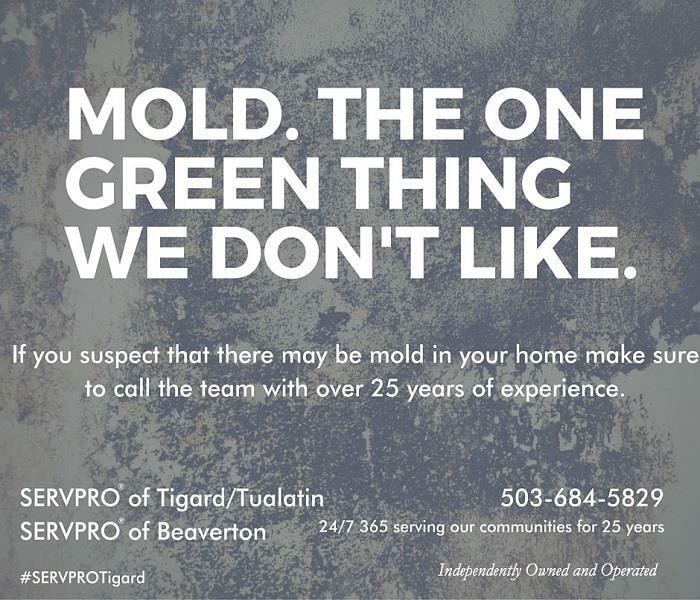 SERVPRO® of Tigard/Tualatin & SERVPRO® of Beaverton is committed to helping you make it “Like it never even happened.” If you think that you may have a mold problem call SERVPRO® of Tigard/Tualatin today to talk about how we can help, we are 24/7 365 at 503-684-5829. How do I take care of this Mold? Is my mold really gone? What is my first step for mold? 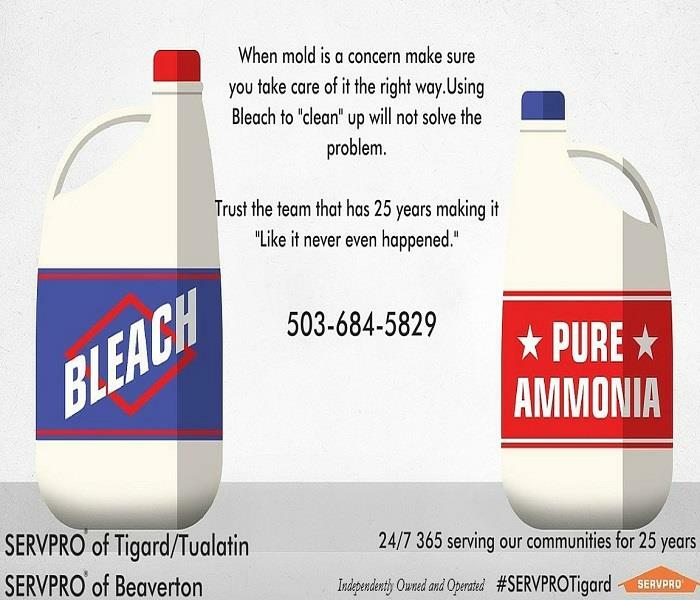 How do you take care of mold? 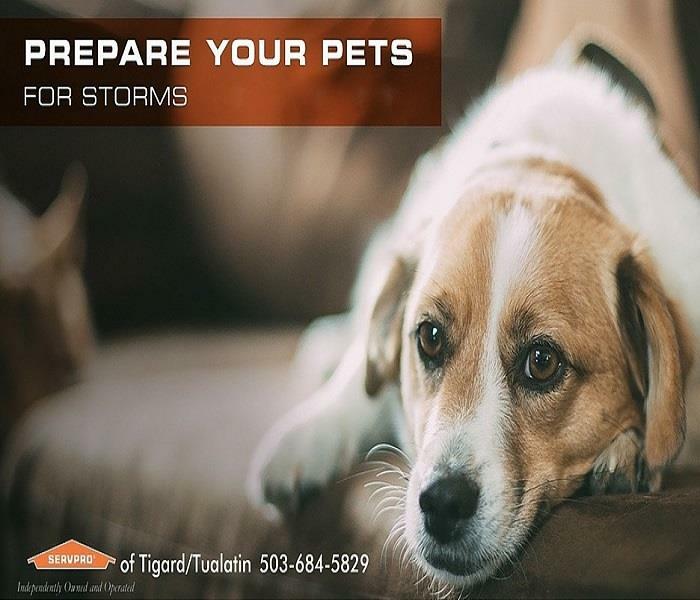 Storms can be scary for both humans and pets. Part of being a good pet owner is having a plan in place if something goes wrong. 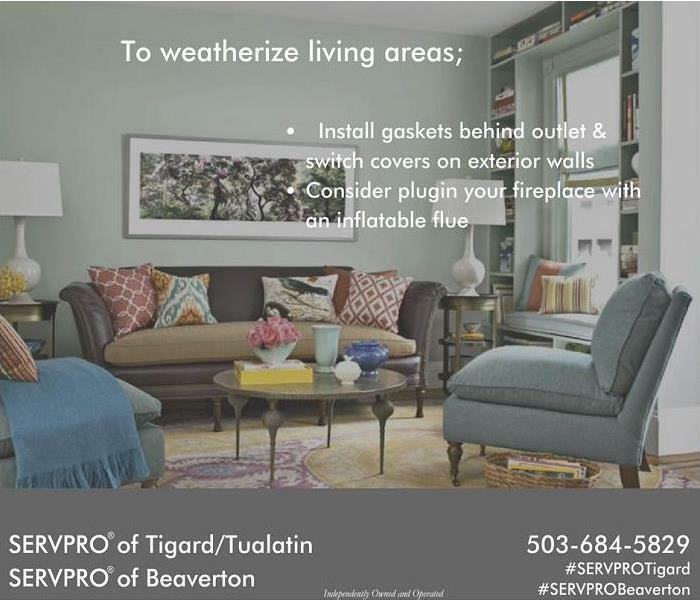 SERVPRO® of Tigard/Tualatin is here to help put a plan in place for when storms affect your life. 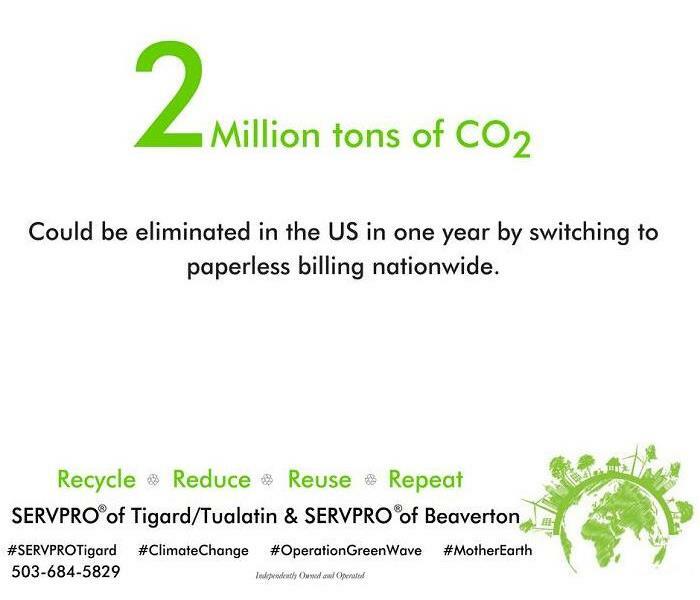 Call us at 503-684-5829 to find out more. 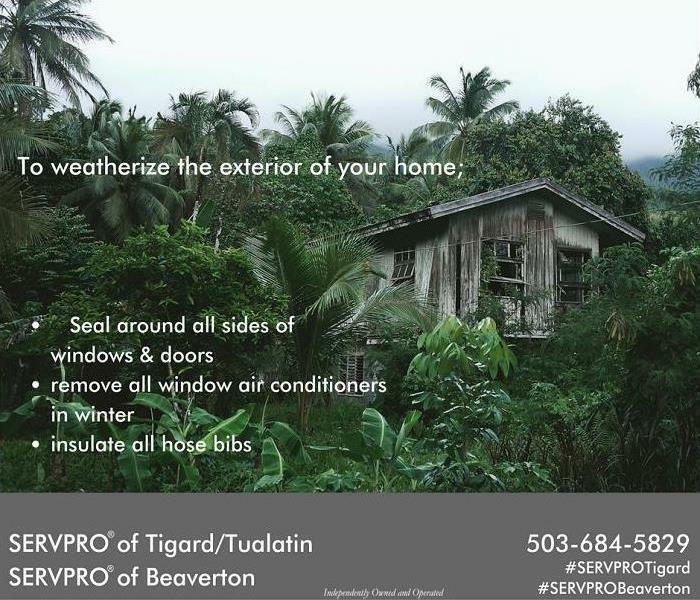 #SERVPROTigard #SERVPROTigard25Years #SERVPROA disaster in a home, your home can be a very traumatic experience for people. We have team of trained crew members who are experienced to help walk with you during the process and see what can be cleaned up and made like new. We love being able to show our customers how their beloved treasures and family heirlooms have cleaned up and will be around for generations to come. We love helping them make it “Like it never even happened." Here are a few before and after photos from a recent clean up that show the state contents are in after a fire and how they come out after our amazing crews clean them up. 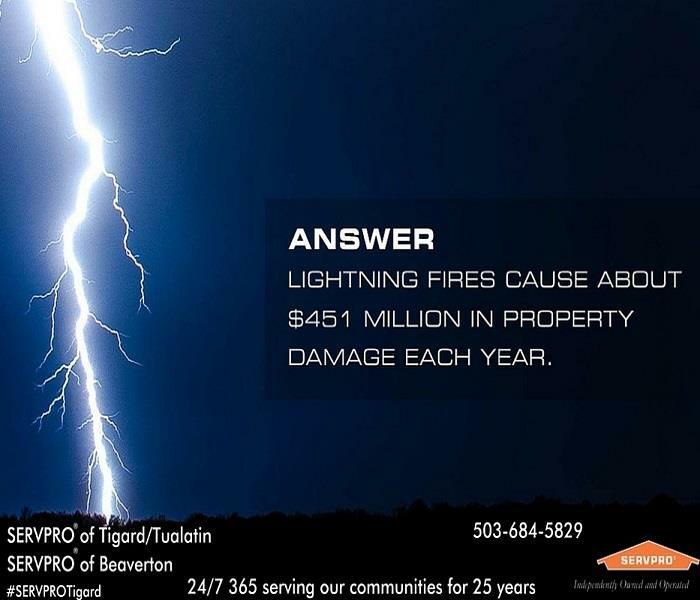 Question: Do you know how much property damage is caused by fires from lightning each year? 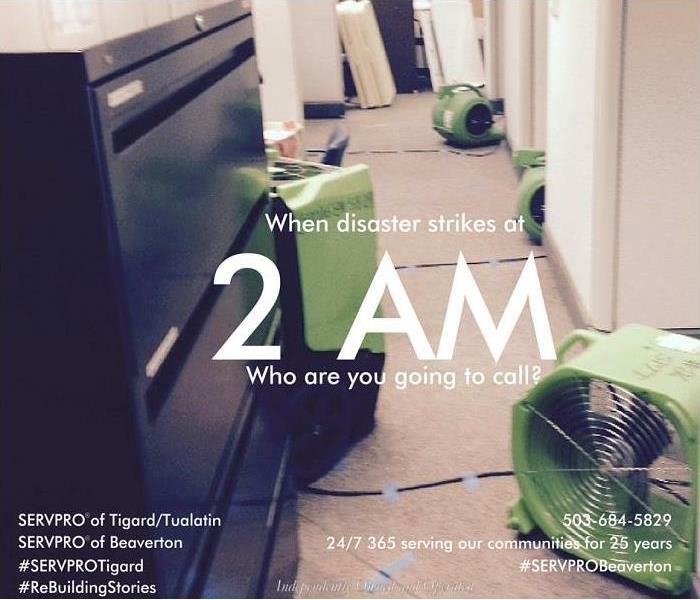 SERVPRO® of Tigard/Tualatin is here 24/7 365 should disaster strike. 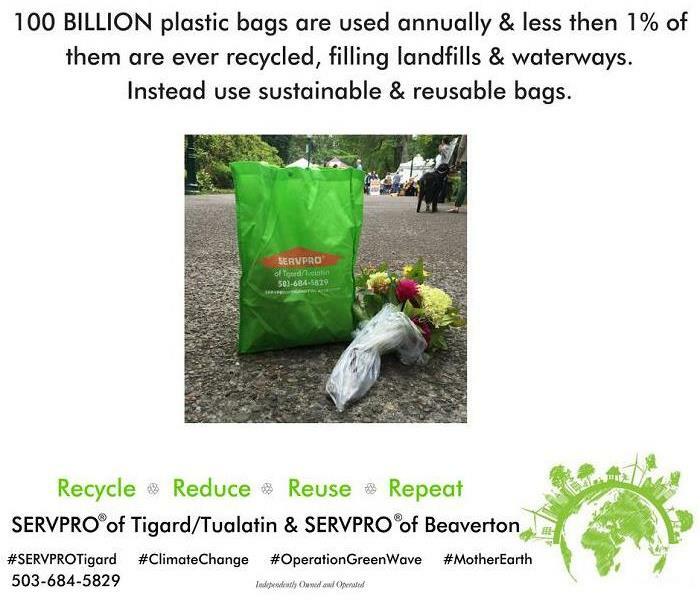 Call us at 503-684-5829. 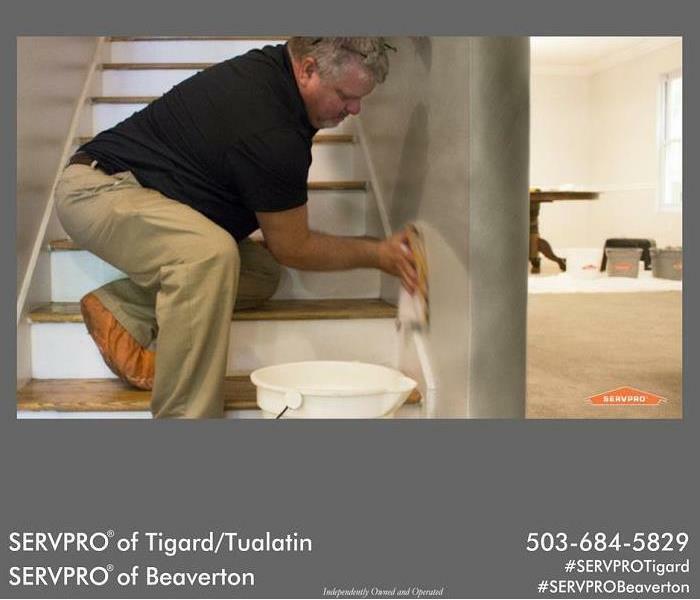 #SERVPROTigard #SERVPROTigard25Years #SERVPRO A disaster in a home, your home can be a very traumatic experience for people. We have team of trained crew members who are experienced to help walk with you during the process and see what can be cleaned up and made like new. We love being able to show our customers how their beloved treasures and family heirlooms have cleaned up and will be around for generations to come. We love helping them make it “Like it never even happened." Here are a few before and after photos from a recent clean up that show the state contents are in after a fire and how they come out after our amazing crews clean them up. 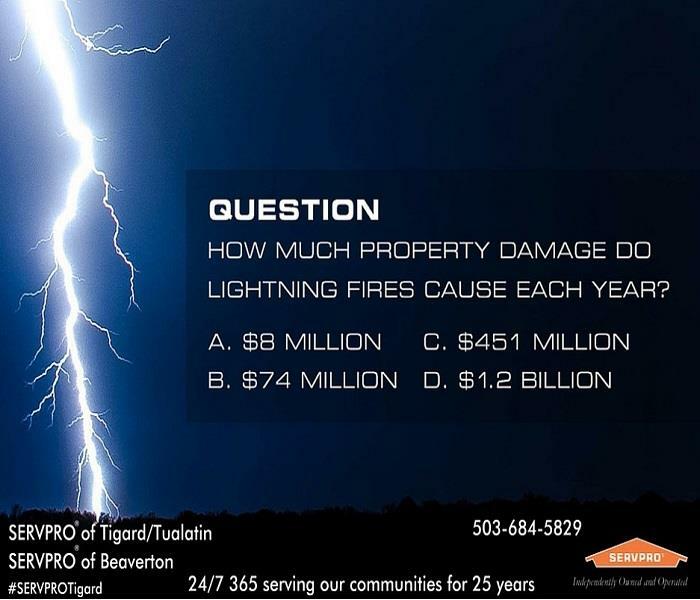 Fire departments respond to more than 22,000 fires per year that were started by lightning, totaling an estimated $451 million in damage. 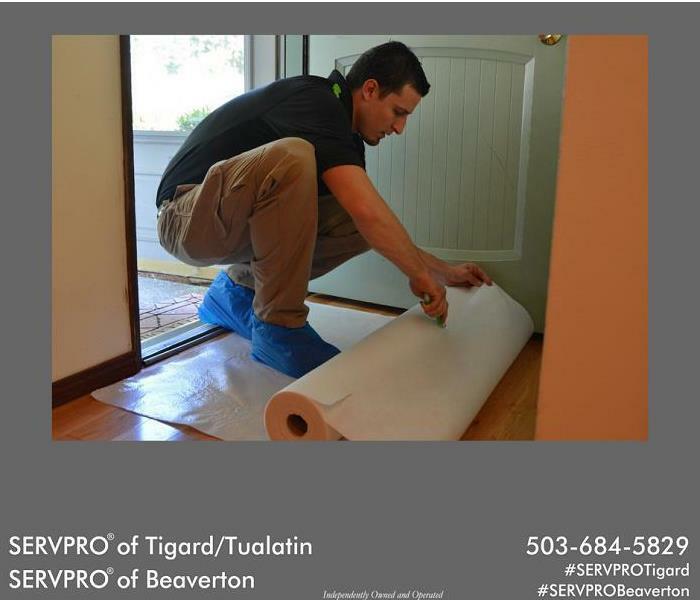 SERVPRO® of Tigard/Tualatin is here 24/7 365 should disaster strike. 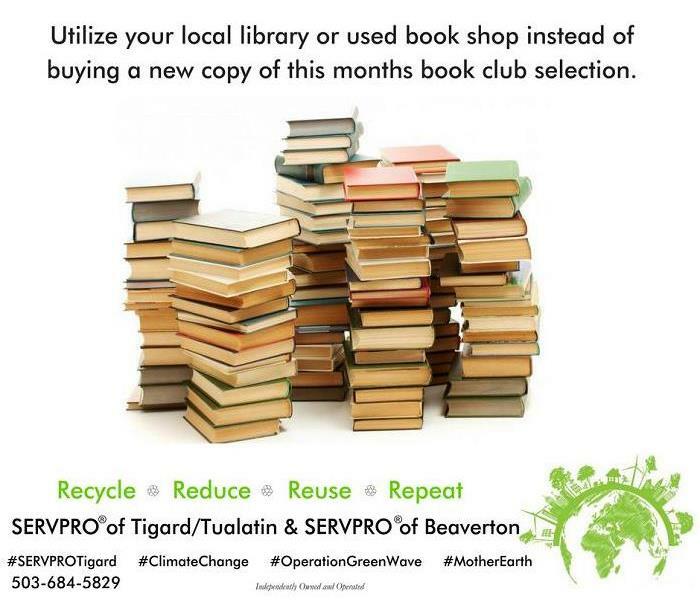 Call us at 503-684-5829. 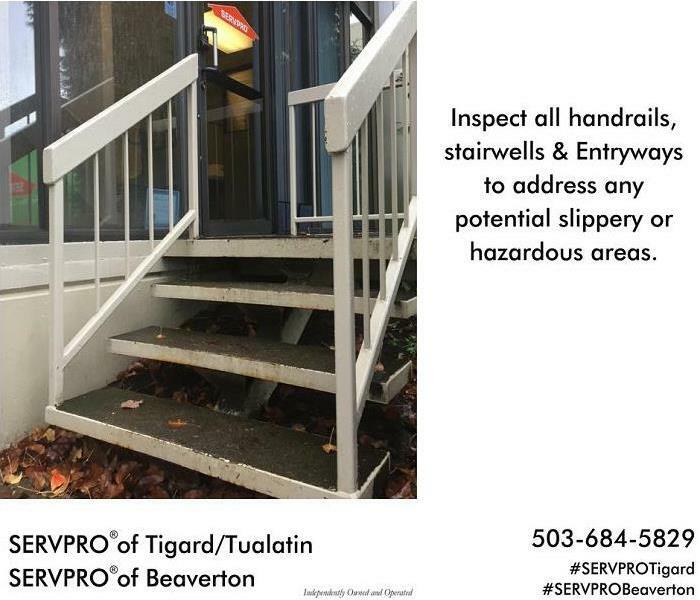 #SERVPROTigard #SERVPROTigard25Years #SERVPROA disaster in a home, your home can be a very traumatic experience for people. We have team of trained crew members who are experienced to help walk with you during the process and see what can be cleaned up and made like new. We love being able to show our customers how their beloved treasures and family heirlooms have cleaned up and will be around for generations to come. We love helping them make it “Like it never even happened." Here are a few before and after photos from a recent clean up that show the state contents are in after a fire and how they come out after our amazing crews clean them up. 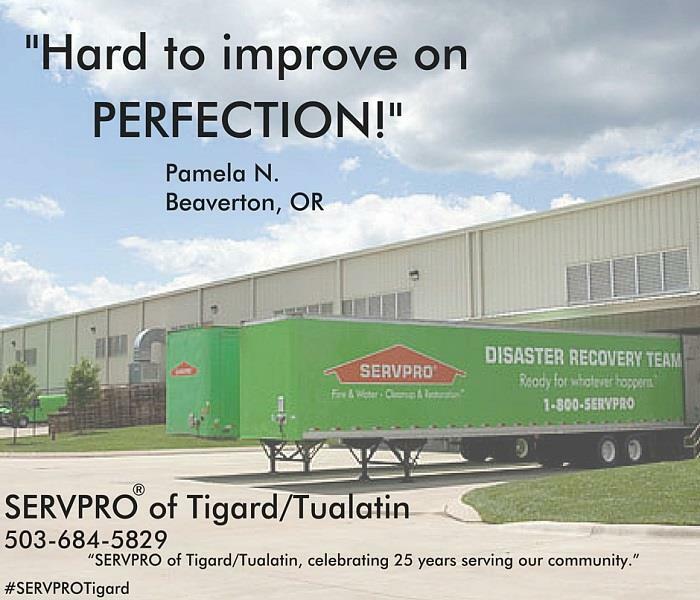 Testimonial Tuesday “Hard to improve on PERFECTION!” Pamela N. Beaverton, OR. 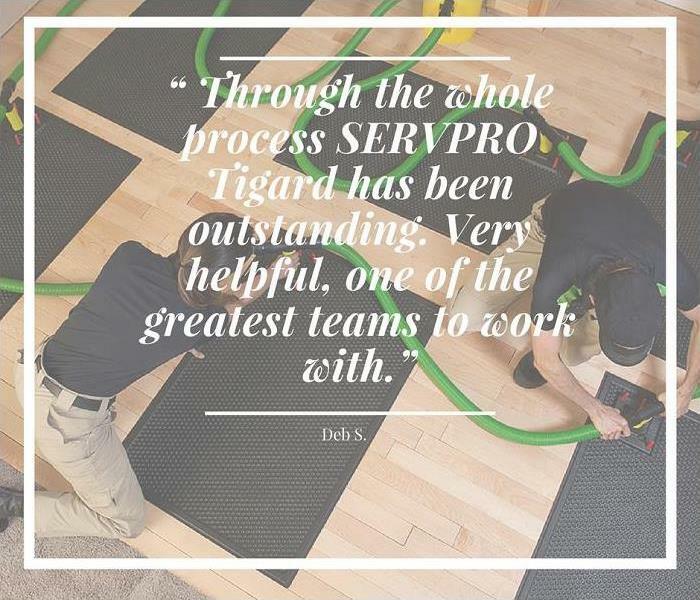 SERVPRO® of Tigard/Tualatin is committed to providing you with the very best customer service. 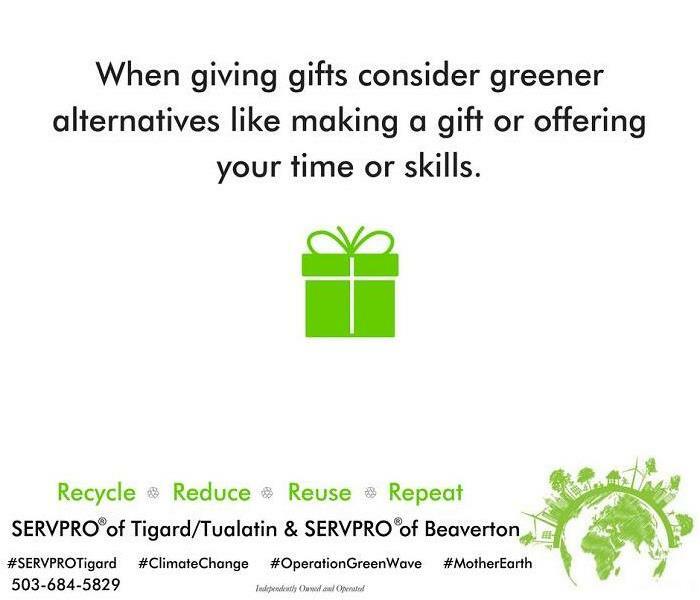 We are ready 24/7 365 to help you, call us at 503-684-5829. 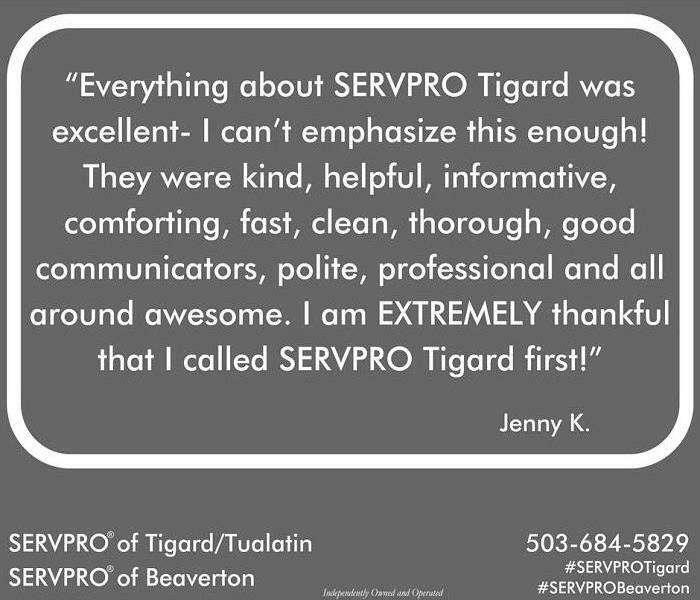 #TestimonialTuesday #SERVPROTigard #HereToHelp #SERVPROTigard25Years #SERVPRO #FirstResponder5KA disaster in a home, your home can be a very traumatic experience for people. We have team of trained crew members who are experienced to help walk with you during the process and see what can be cleaned up and made like new. We love being able to show our customers how their beloved treasures and family heirlooms have cleaned up and will be around for generations to come. We love helping them make it “Like it never even happened." Here are a few before and after photos from a recent clean up that show the state contents are in after a fire and how they come out after our amazing crews clean them up. 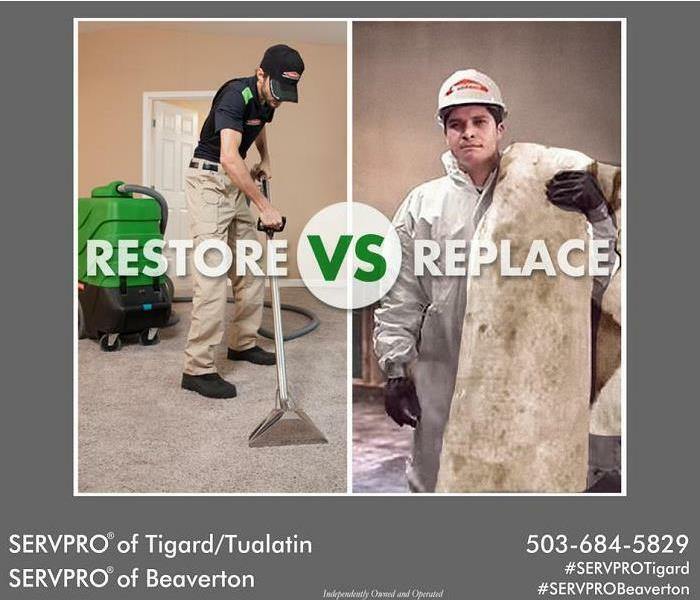 Though some companies claim to offer “mold removal”, SERVPRO® of Tigard/Tualatin understands the science behind mold and offers true remediation. 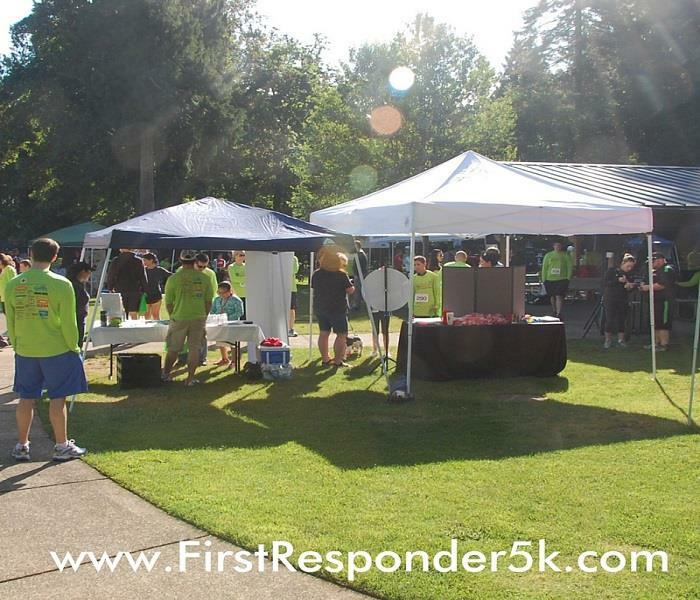 Fine out more call at 503-684-5829. 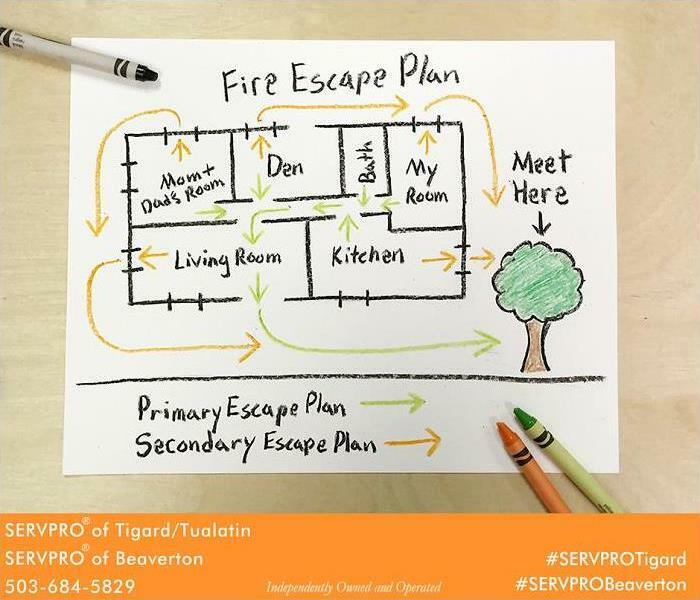 #SERVPROTigard #HereToHelp #SERVPROTigard25Years #SERVPRO #FirstResponder5KA disaster in a home, your home can be a very traumatic experience for people. We have team of trained crew members who are experienced to help walk with you during the process and see what can be cleaned up and made like new. We love being able to show our customers how their beloved treasures and family heirlooms have cleaned up and will be around for generations to come. We love helping them make it “Like it never even happened." Here are a few before and after photos from a recent clean up that show the state contents are in after a fire and how they come out after our amazing crews clean them up. 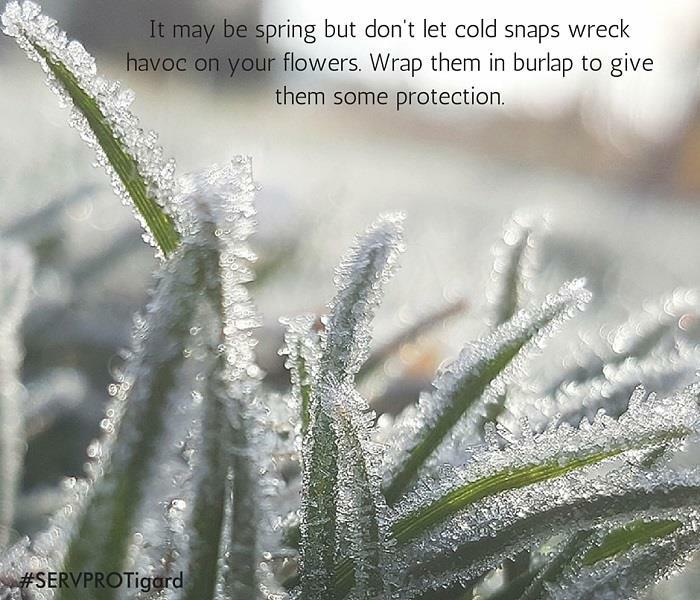 It may be spring, but don't let an unexpectedly cold night wreak havoc on your budding flowers. 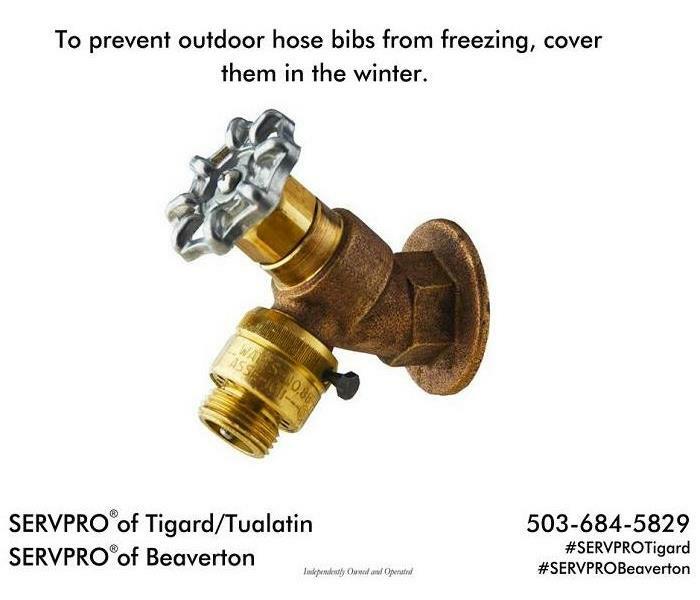 If the temps lower, give them cover by wrapping them in burlap. 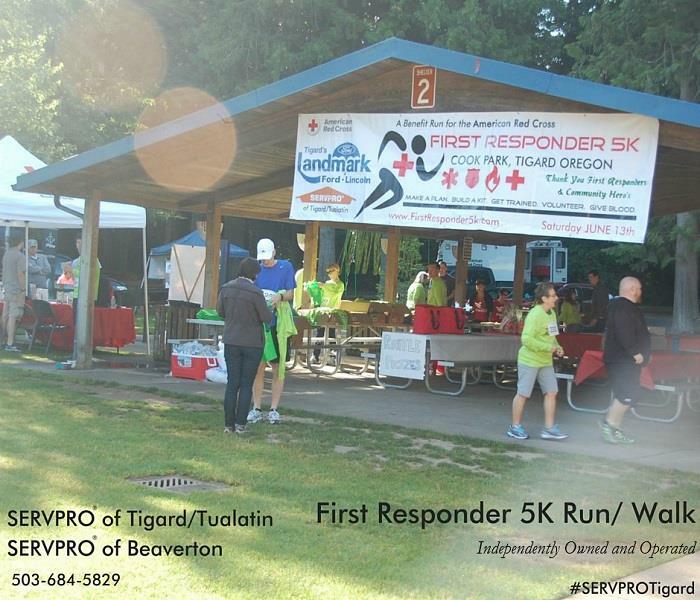 #Spring #SERVPROTigard #HereToHelp #SERVPROTigard25Years #SERVPRO #FirstResponder5K A disaster in a home, your home can be a very traumatic experience for people. We have team of trained crew members who are experienced to help walk with you during the process and see what can be cleaned up and made like new. We love being able to show our customers how their beloved treasures and family heirlooms have cleaned up and will be around for generations to come. We love helping them make it “Like it never even happened." Here are a few before and after photos from a recent clean up that show the state contents are in after a fire and how they come out after our amazing crews clean them up. 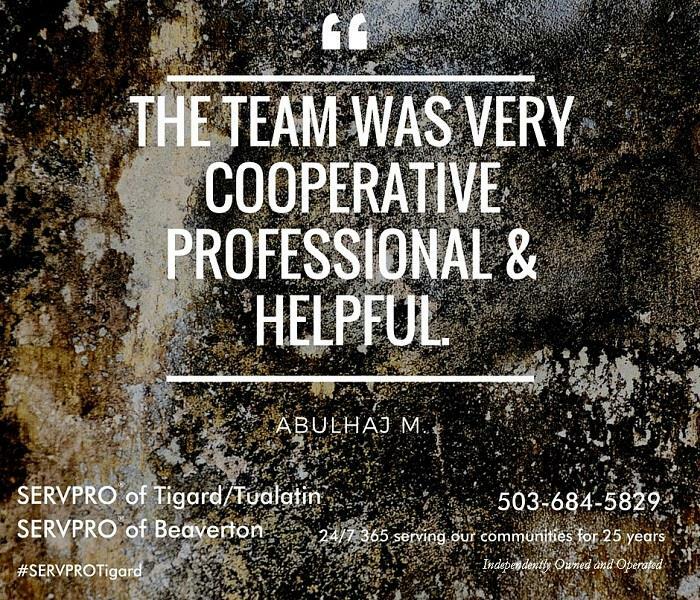 Testimonial Tuesday: “The team was very cooperative, professional and very helpful!” Khawla M. Water Damage. 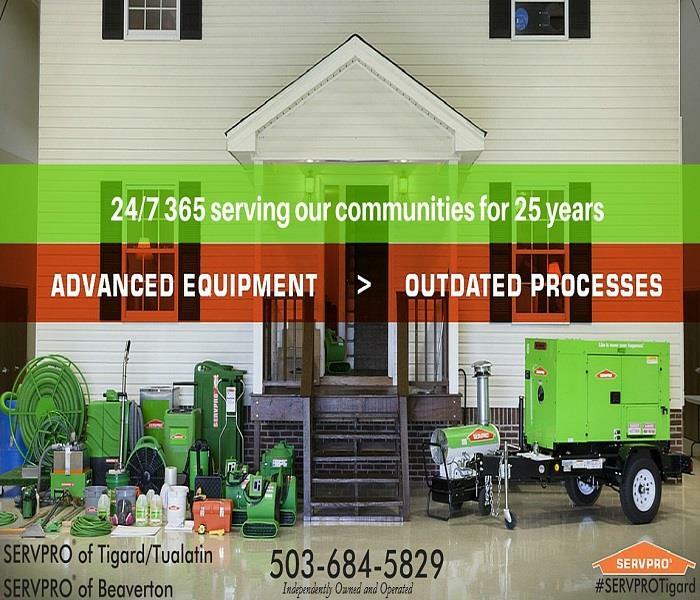 SERVPRO® of Tigard/Tualatin is ready 24/7 365 to help when disaster strikes. 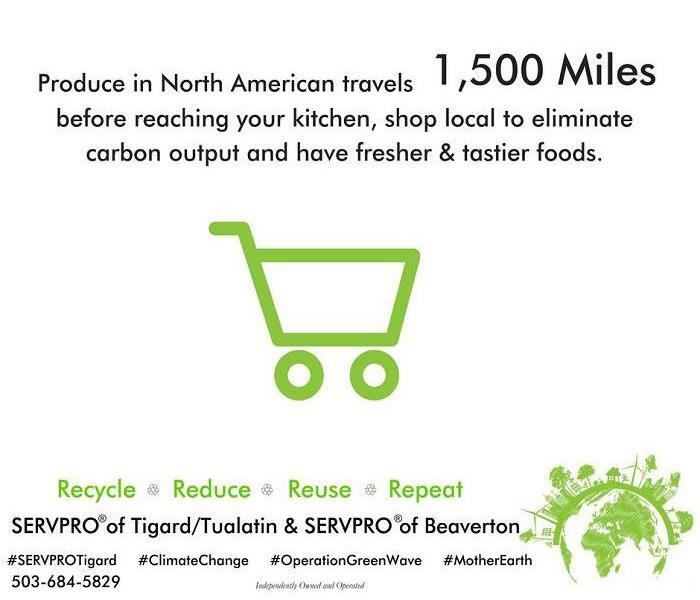 Call us at 503-684-5829. 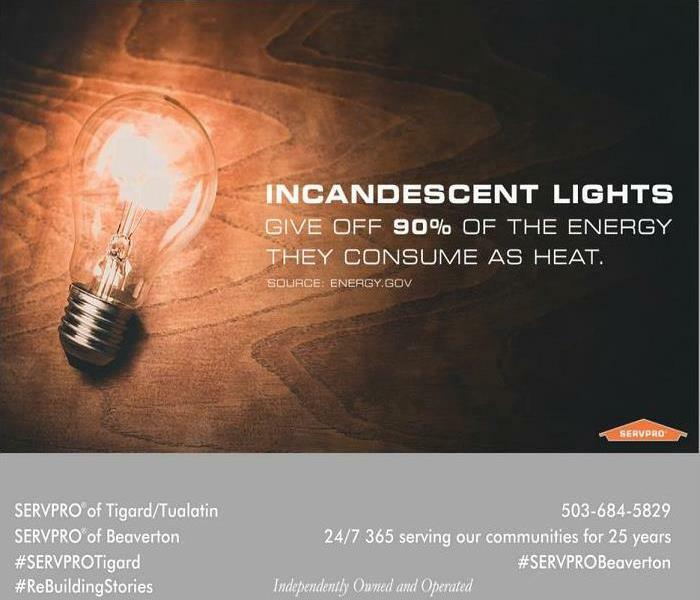 #SERVPROTigard #HereToHelp #SERVPROTigard25Years #SERVPRO #TestimonialTuesday A disaster in a home, your home can be a very traumatic experience for people. 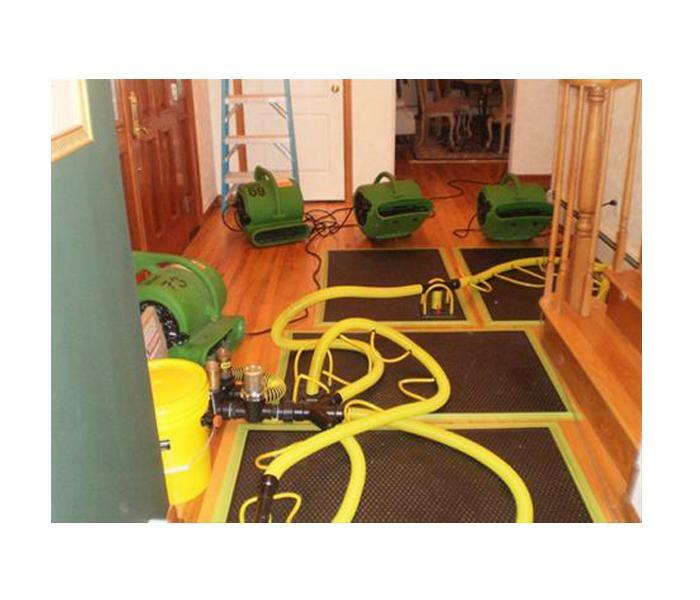 We have team of trained crew members who are experienced to help walk with you during the process and see what can be cleaned up and made like new. We love being able to show our customers how their beloved treasures and family heirlooms have cleaned up and will be around for generations to come. We love helping them make it “Like it never even happened." Here are a few before and after photos from a recent clean up that show the state contents are in after a fire and how they come out after our amazing crews clean them up. 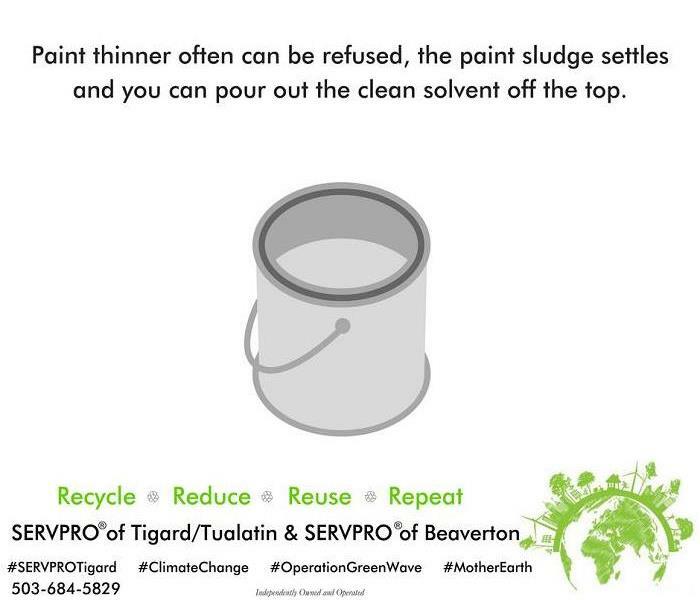 Happy Friday from #JohnTheWaterTech and all of us at #SERVPROTigard. 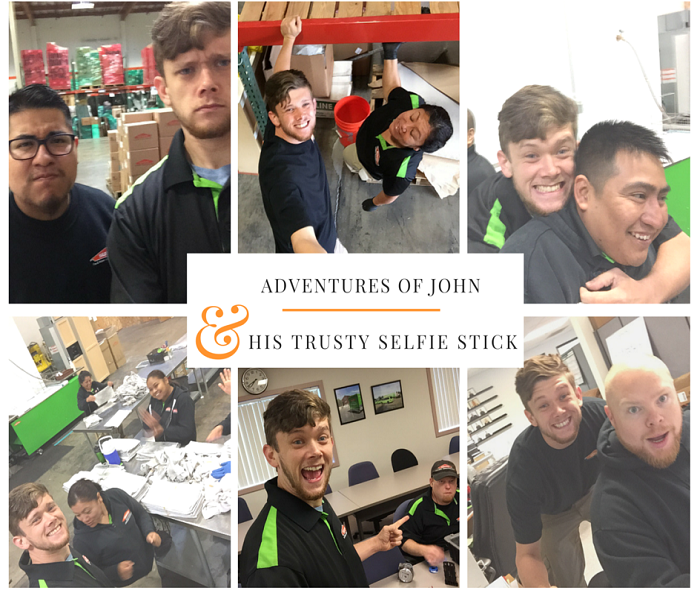 #TGIF #HappyFriday #SERVPRO #SERVPROLife #Selfie #ButFirstLetMeTakeASelfie #LetMeTakeASelfie #JohnAndHisTrustySelfieStick SERVPRO® of Tigard/Tualatin and SERVPRO ® of Beaverton have been serving our communities for 25 years. Our crews trained and equipped to help you when disaster strikes. We are committed to helping customers just like you when disaster strikes. We are a twenty four hour a day emergency service provider. We work 365 days a year, when you call, your call will be answered. Even at two AM, not only will your call be answered but you will speak to one of our trained managers or even our owner. You will never speak to an answering service in your hour of need. 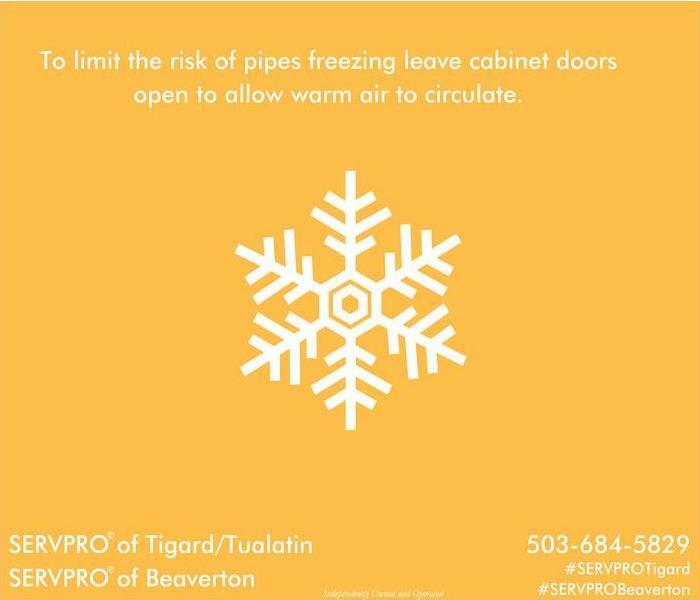 So if disaster should ever strike make sure to call SERVPRO® of Tigard/Tualatin and SERVPRO® of Beaverton at 503-684-5829. 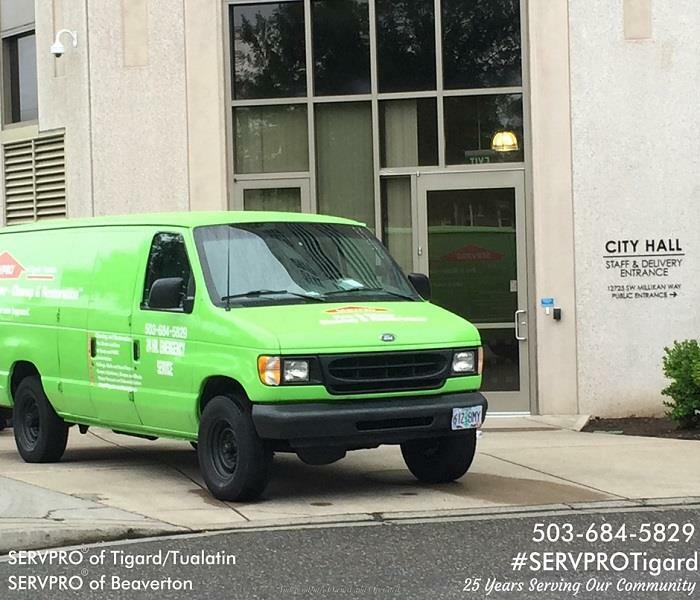 SERVPRO of Tigard/Tualatin & SERVPRO® of Beaverton are ready 24/7 to respond to disaster, big or small. 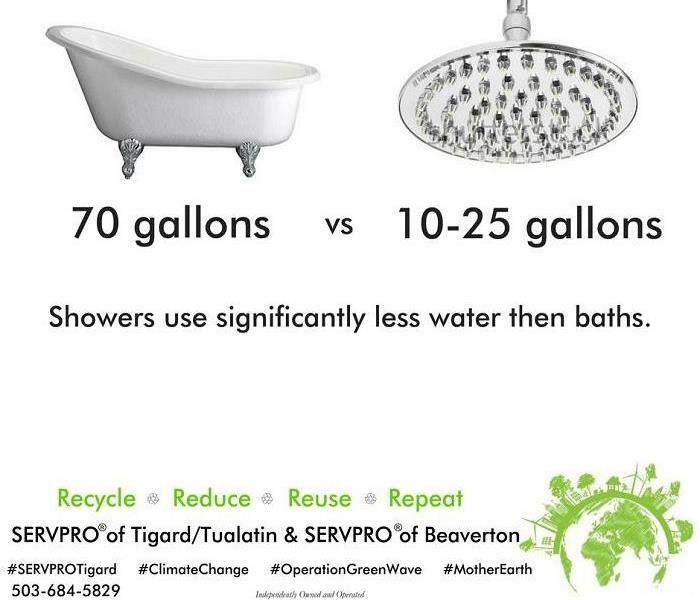 Like last night, when a local government called at 11:45 PM with a large water loss. 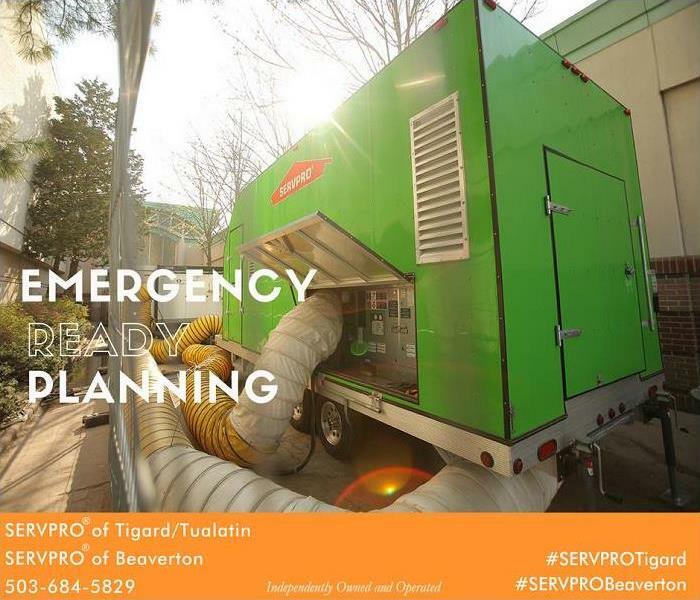 Since our phones are never sent to an answering service the caller spoke with Kathy Linderman our owner and was able to be reassured that we would be on site very soon and make it “Like it never even happened.” We were on site in 40 minutes to evaluate and START mitigation. 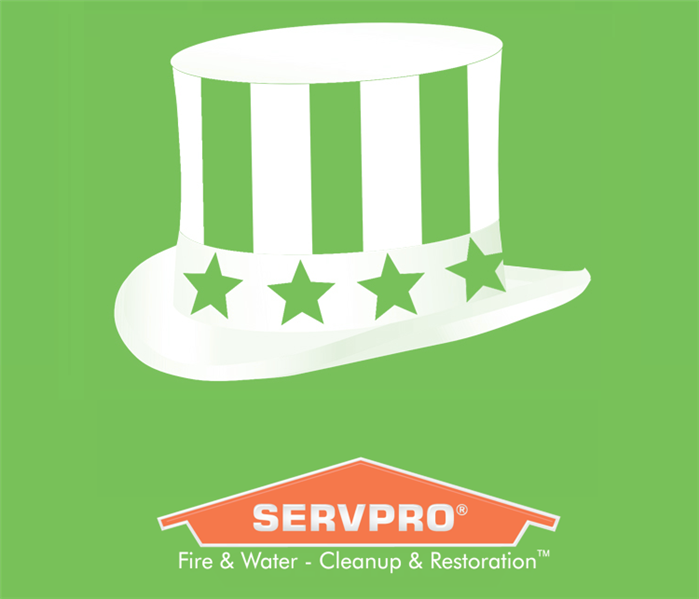 When water is coming through the ceiling response time is crucial and that starts with not having to leave a voice mail or speak with an answering service. We were able to get on site and will help them get back to work sooner to allow them to get back to working for their community. 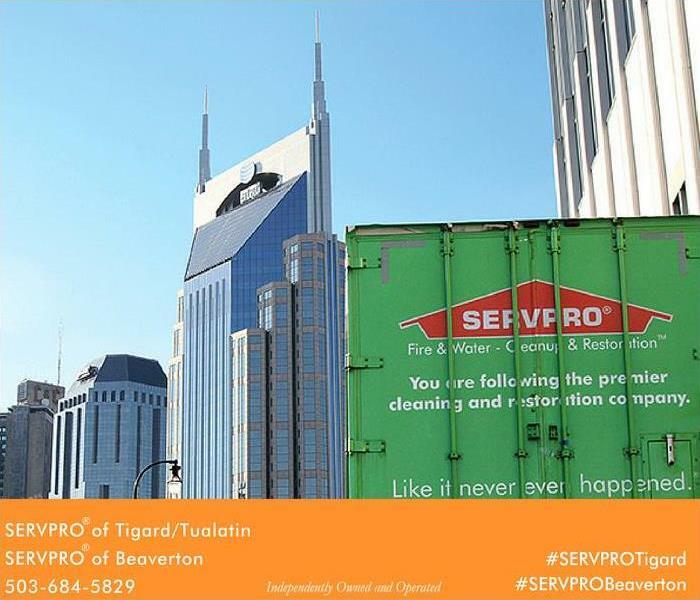 SERVPRO® of Tigard/Tualatin & SERVPRO® of Beaverton are ready, trained and experienced to help you when disaster strikes, no matter the size. 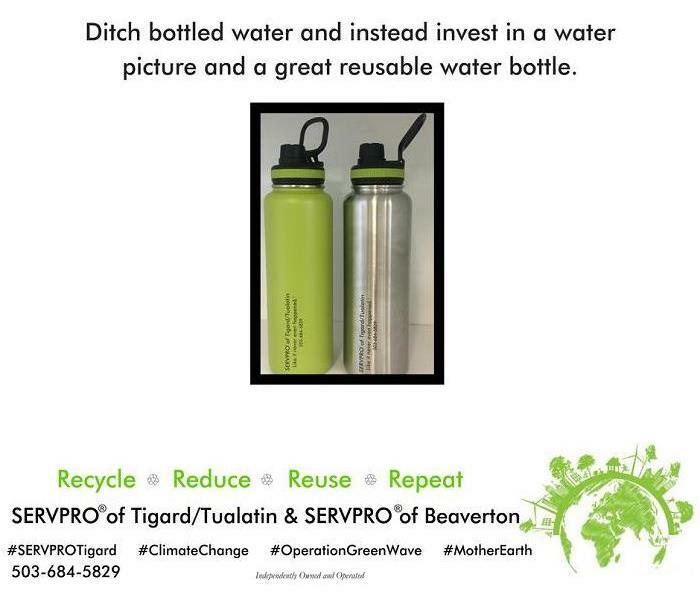 #JohnTheWaterTech wanted to wish you all a Happy Friday! 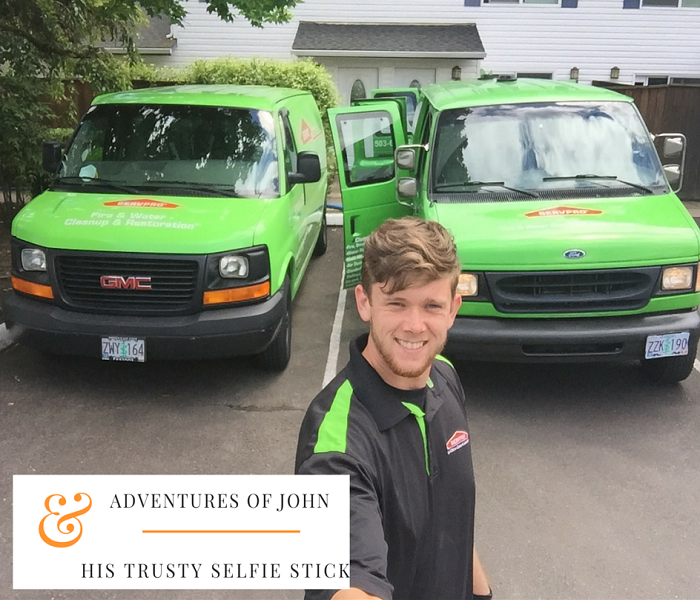 #TGIF #HappyFriday #SERVPROTigard #SERVPRO #SERVPROLife #Selfie #ButFirstLetMeTakeASelfie #LetMeTakeASelfie #JohnAndHisTrustySelfieStick SERVPRO® of Tigard/Tualatin and SERVPRO ® of Beaverton have been serving our communities for 25 years. Our crews trained and equipped to help you when disaster strikes. We are committed to helping customers just like you when disaster strikes. We are a twenty four hour a day emergency service provider. We work 365 days a year, when you call, your call will be answered. Even at two AM, not only will your call be answered but you will speak to one of our trained managers or even our owner. You will never speak to an answering service in your hour of need. 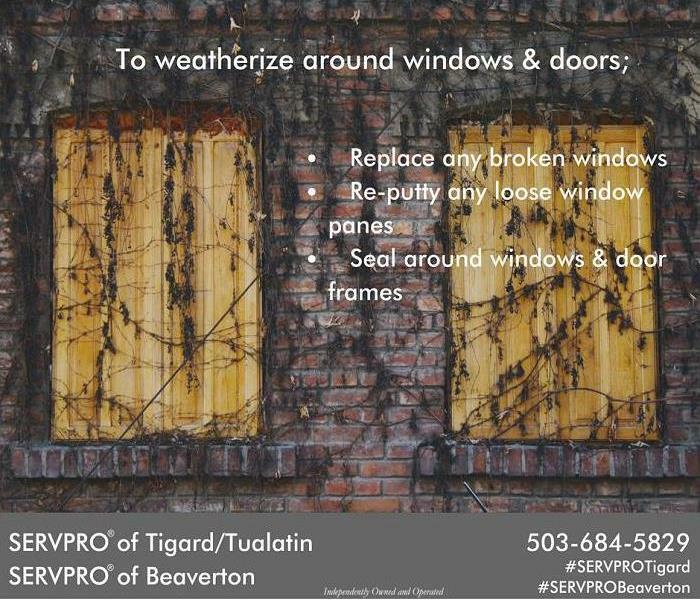 So if disaster should ever strike make sure to call SERVPRO® of Tigard/Tualatin and SERVPRO® of Beaverton at 503-684-5829.